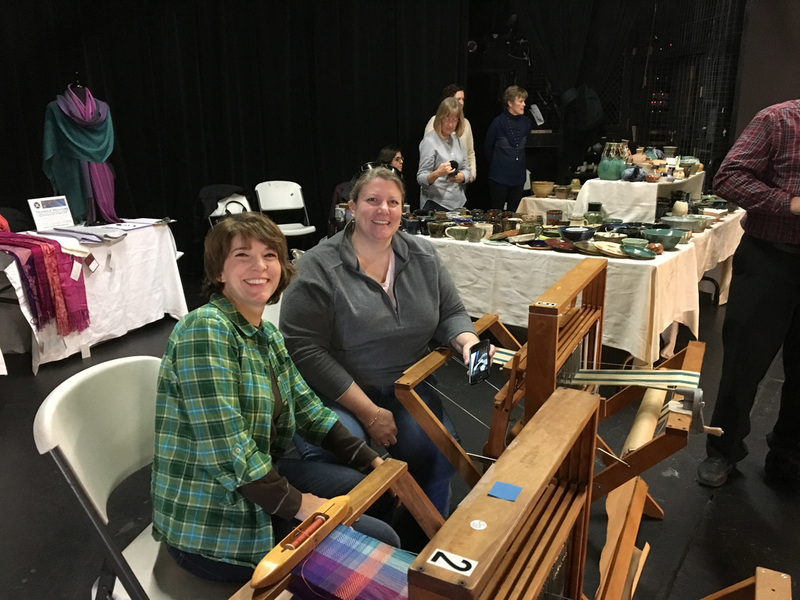 A fun day with great turnout and lots of guild participation! 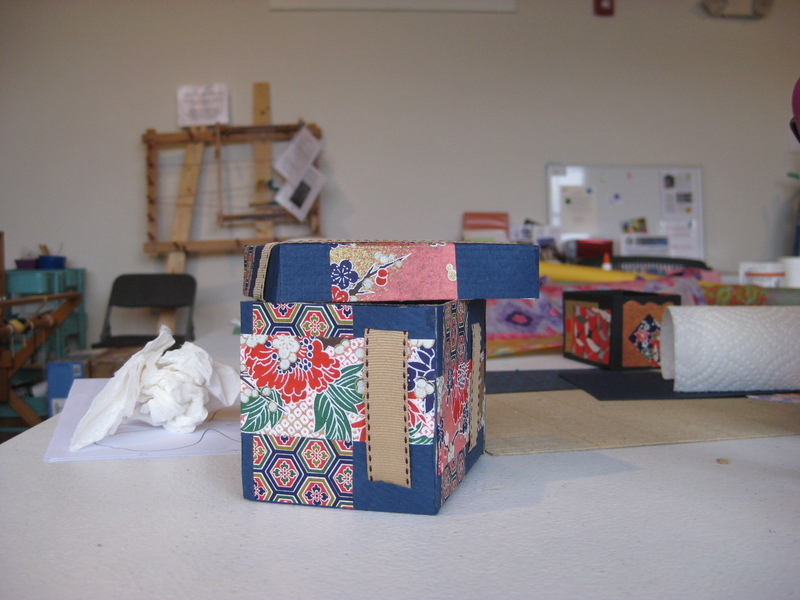 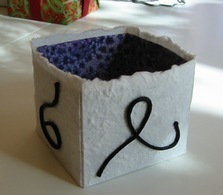 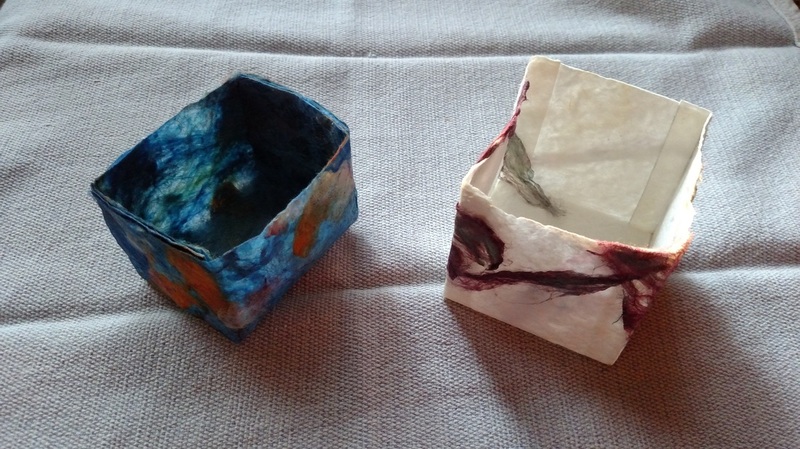 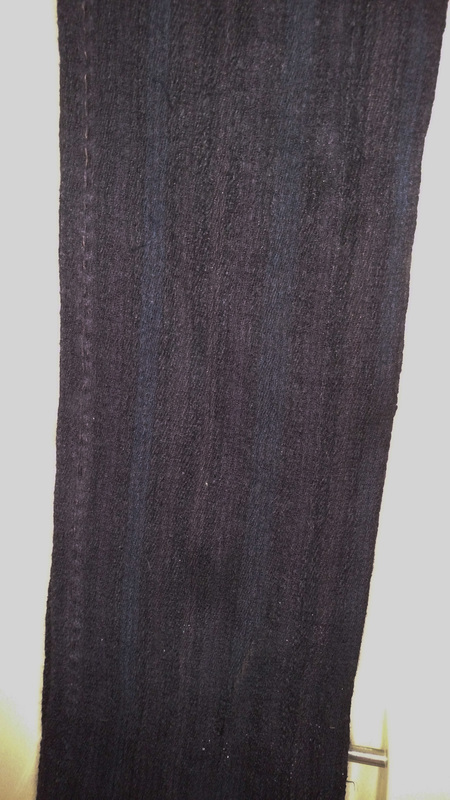 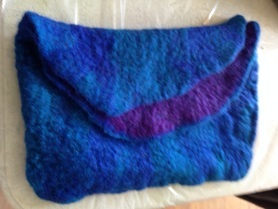 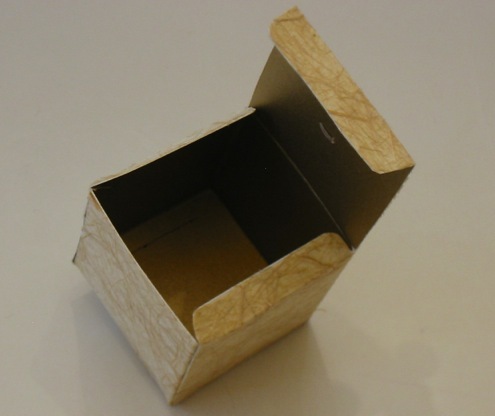 Jean Johnson's mulberry paper box has black rayon cord attached to the outside with hand stitching. 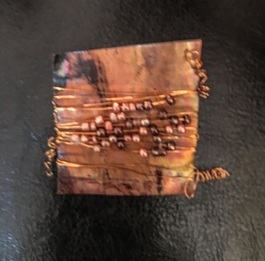 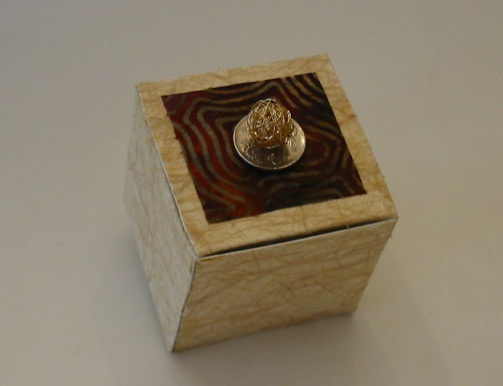 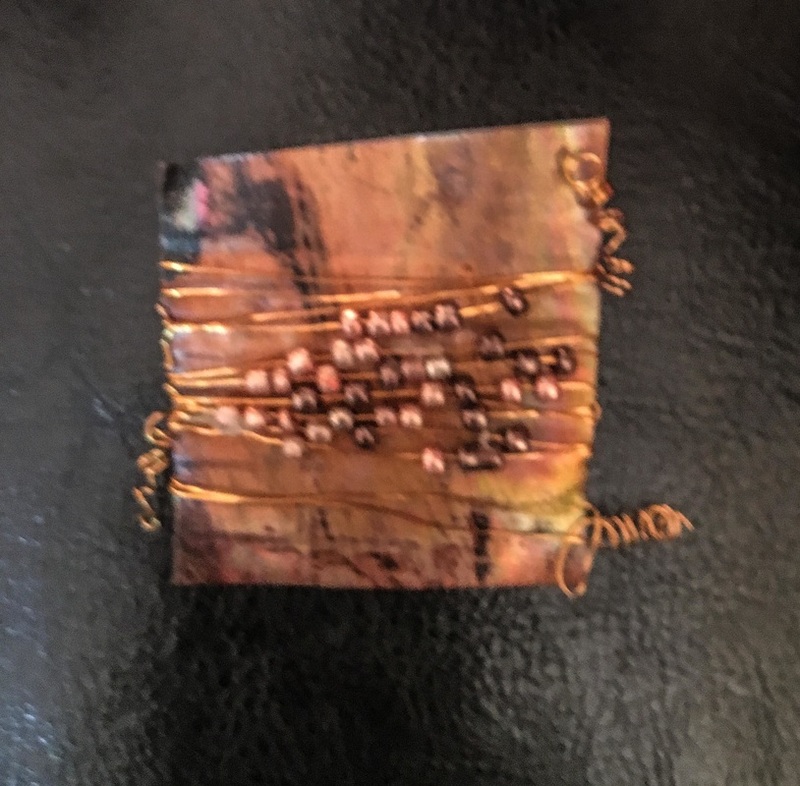 This small gold box by Jean Johnson has a piece of Dianne’s batik fabric topped with a Japanese coin, and then a small ball of wound gold wire. 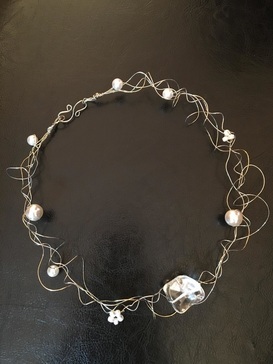 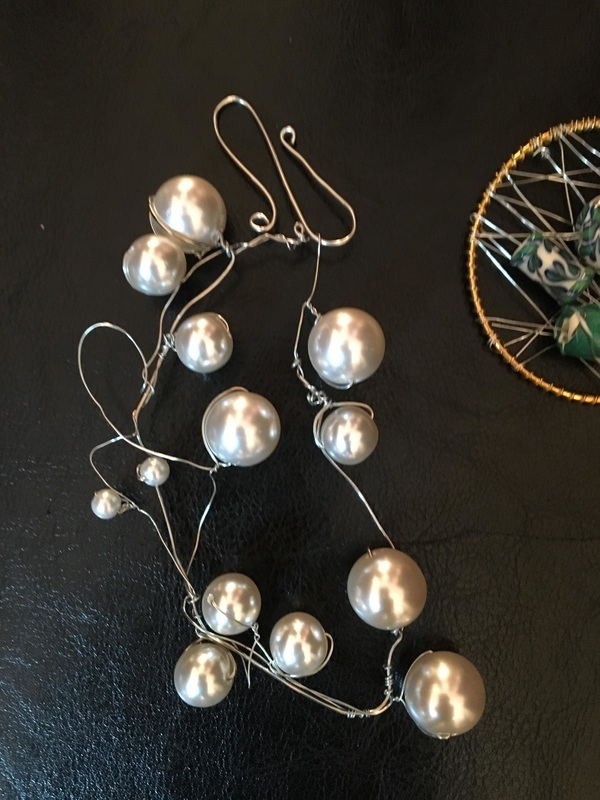 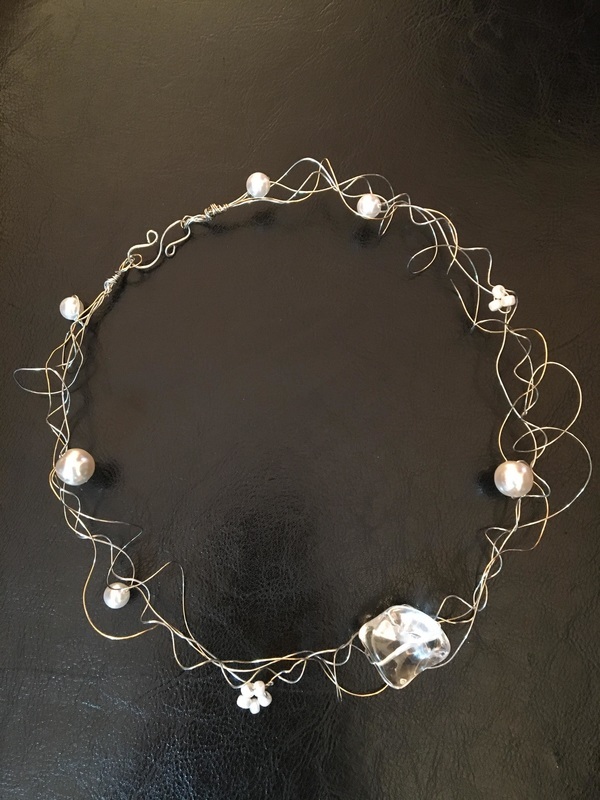 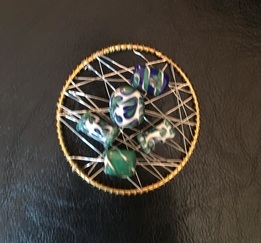 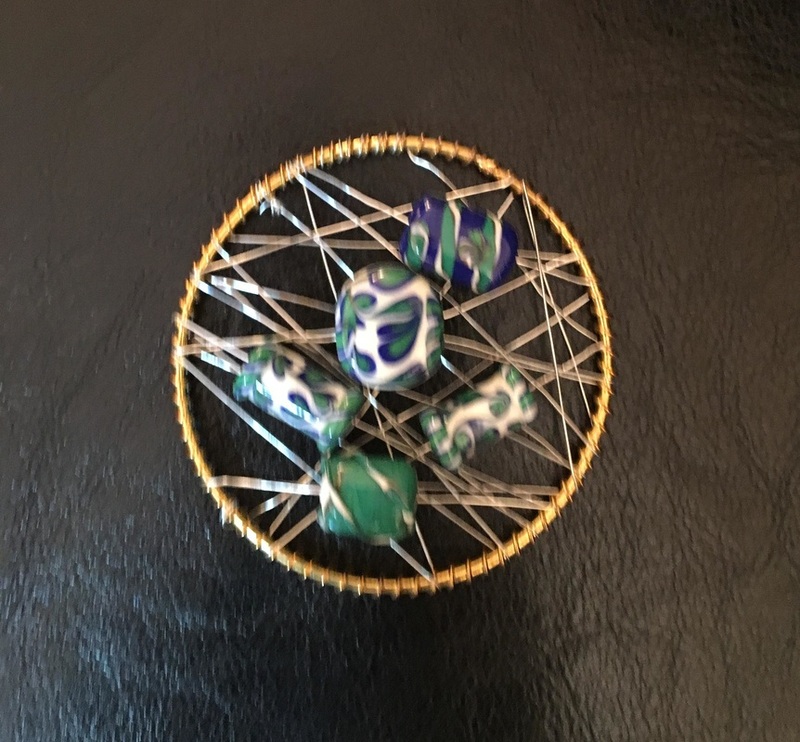 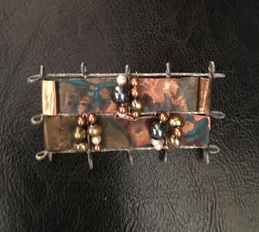 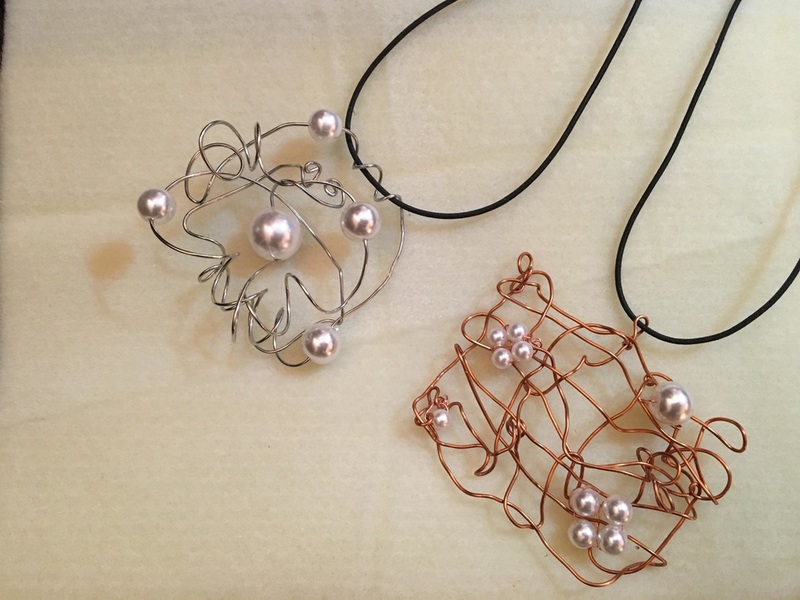 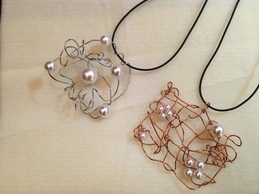 The wire balls were done in Debbie Suchoff’s jewelry class — so this one combines two Illuninations in one. 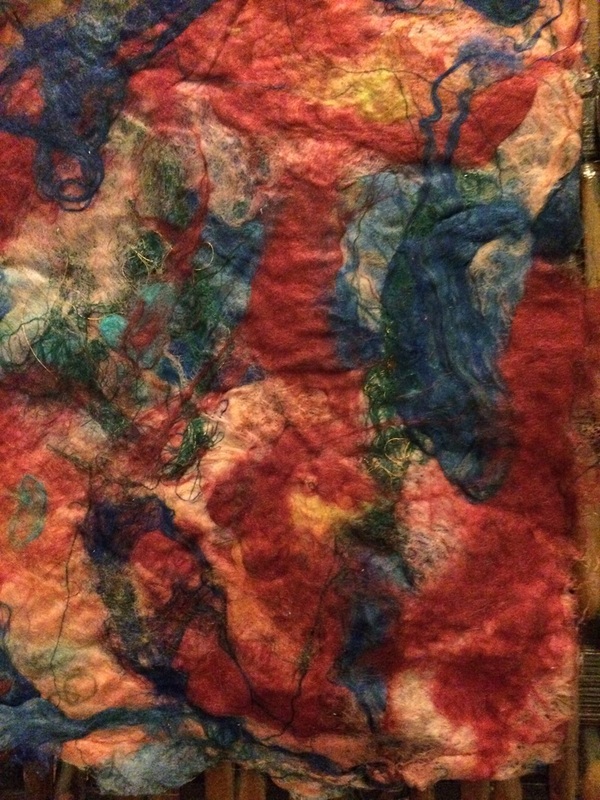 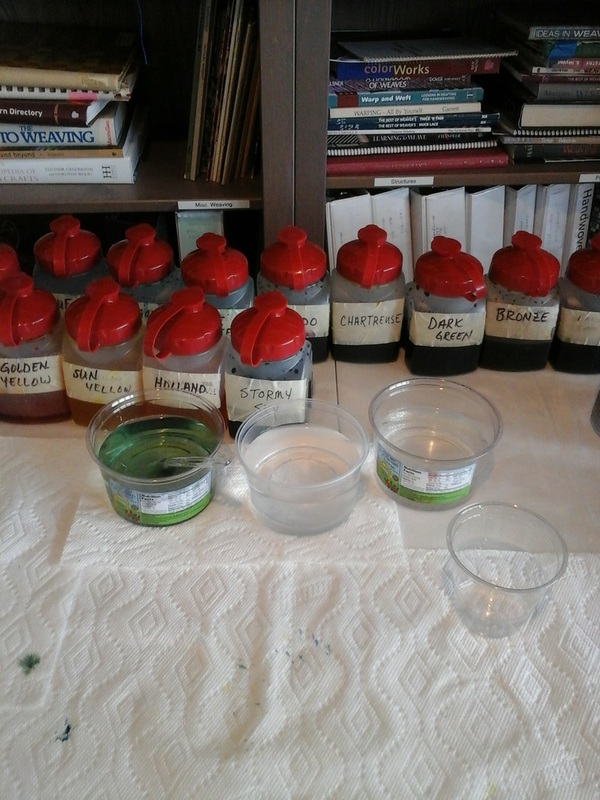 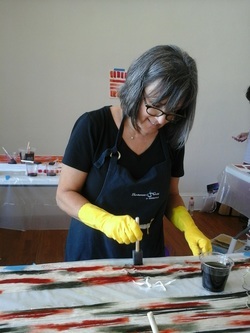 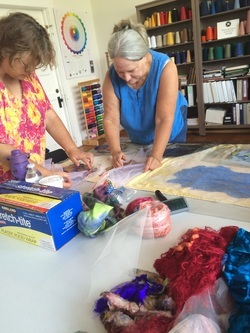 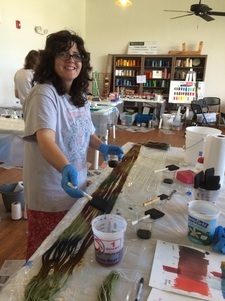 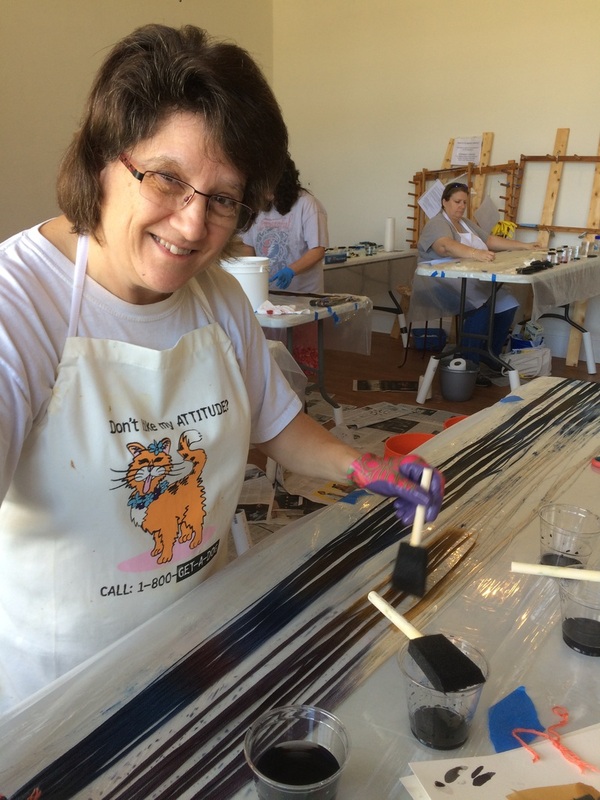 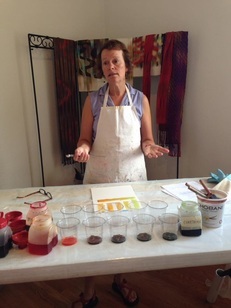 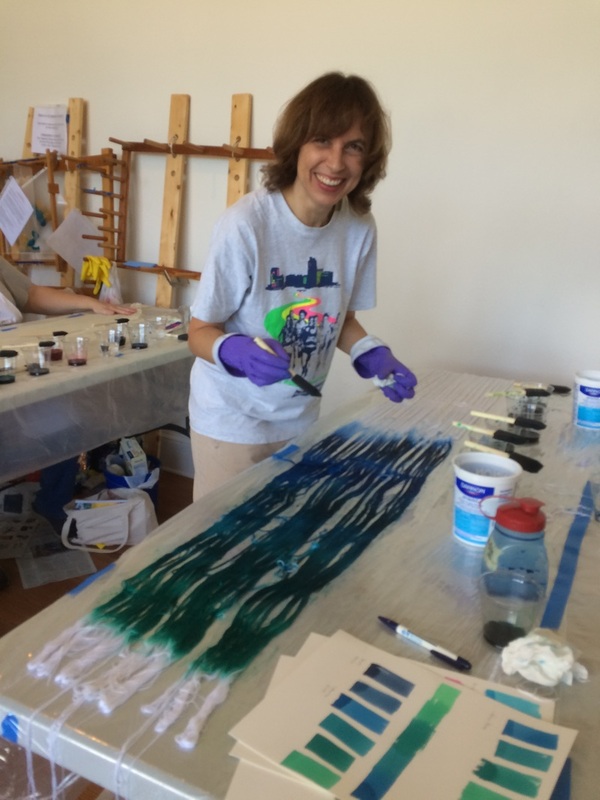 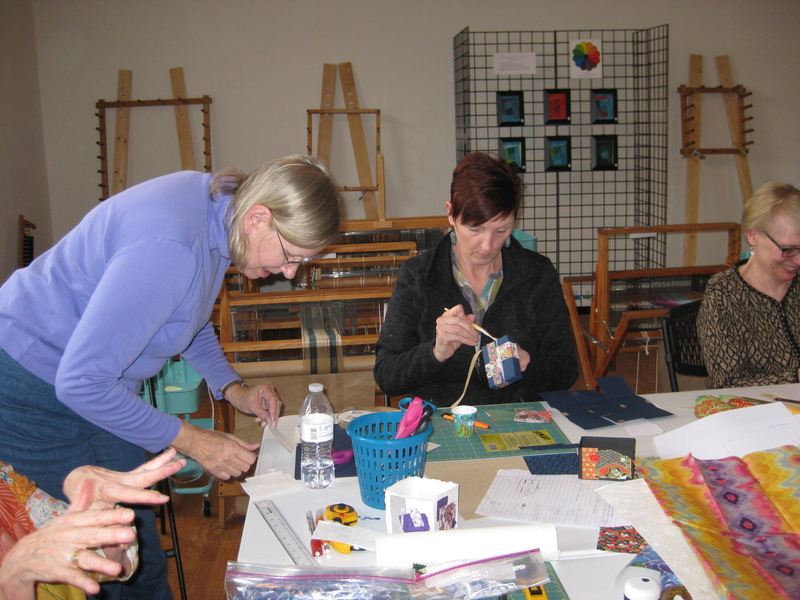 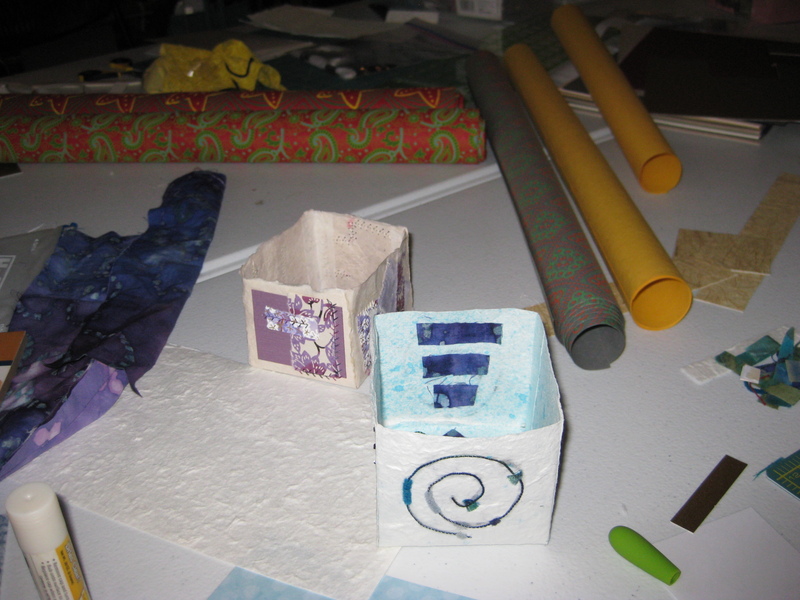 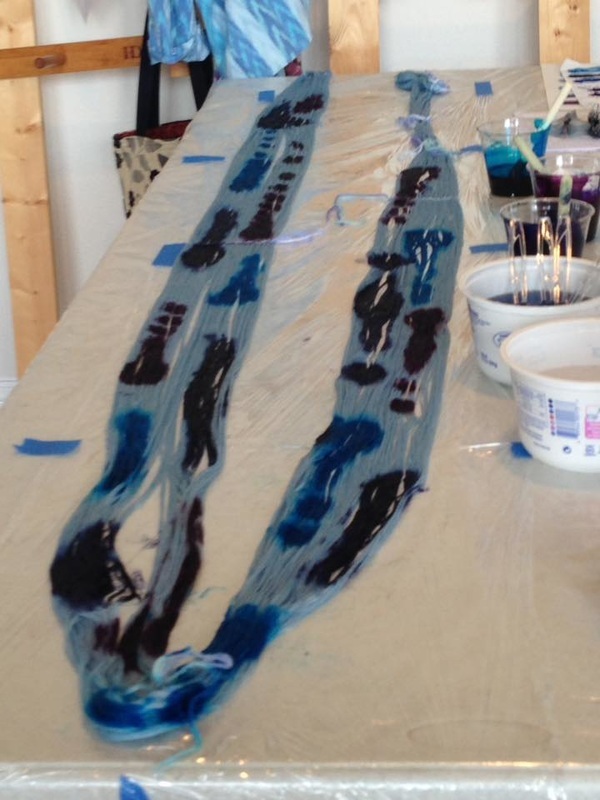 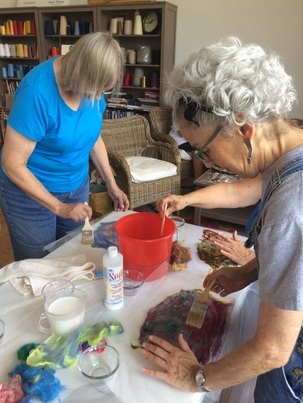 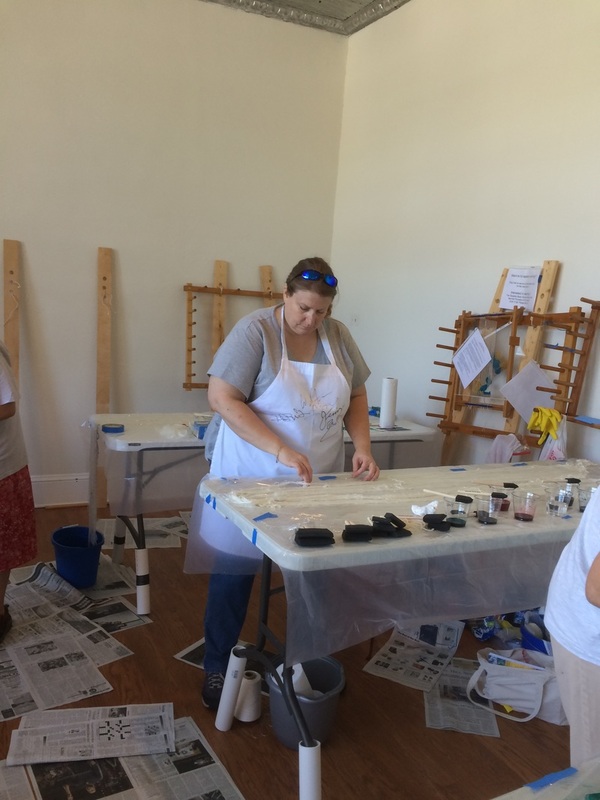 Creativity and fun flowed freely at our Saturday visit to Debbie's home studio. 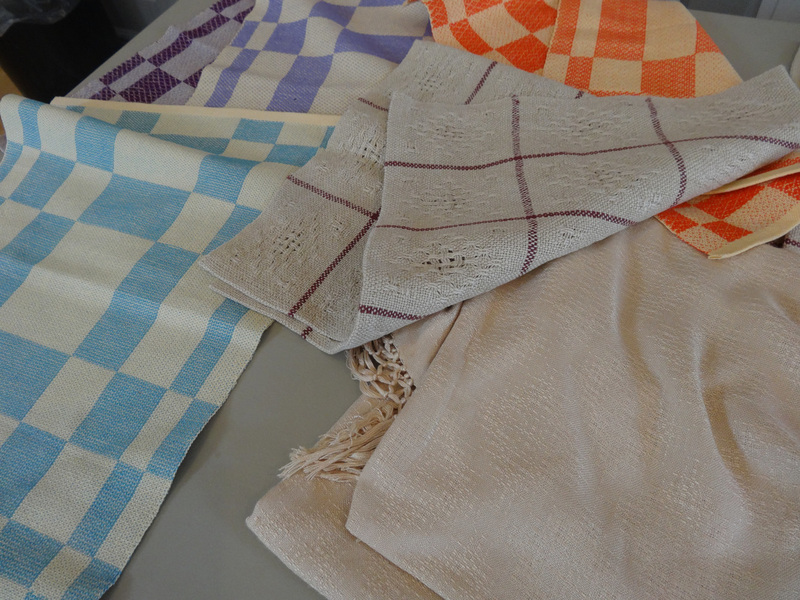 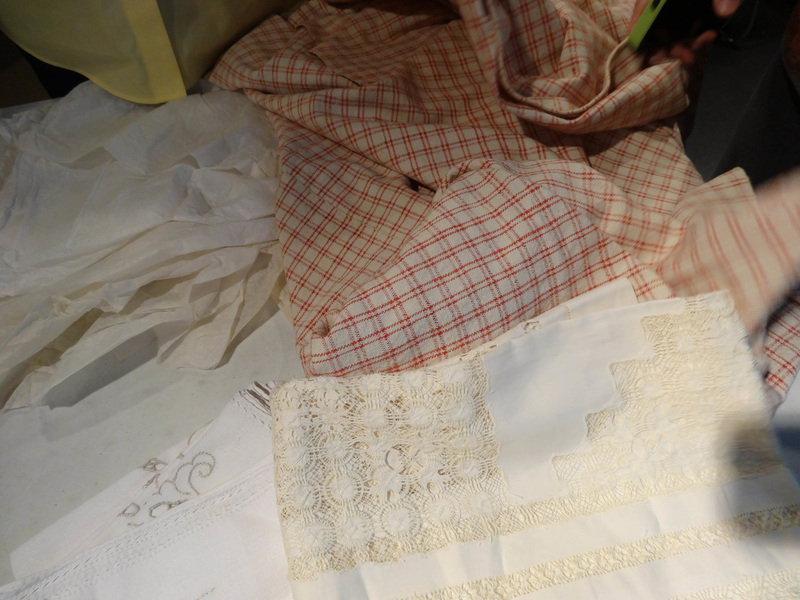 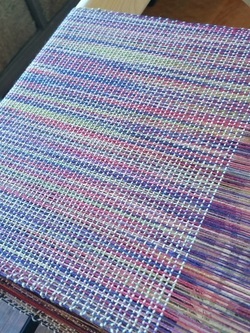 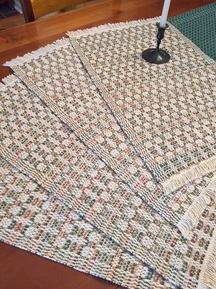 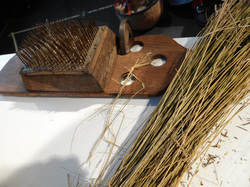 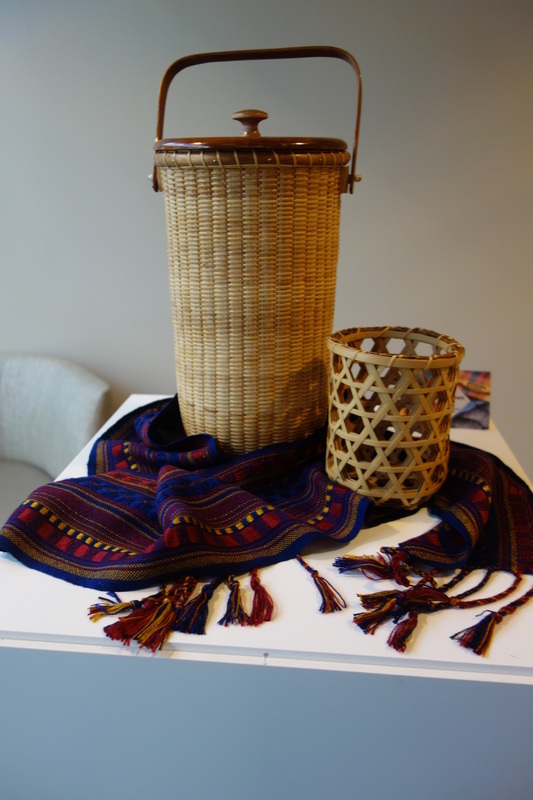 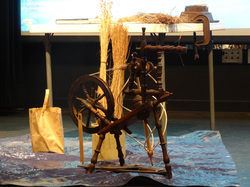 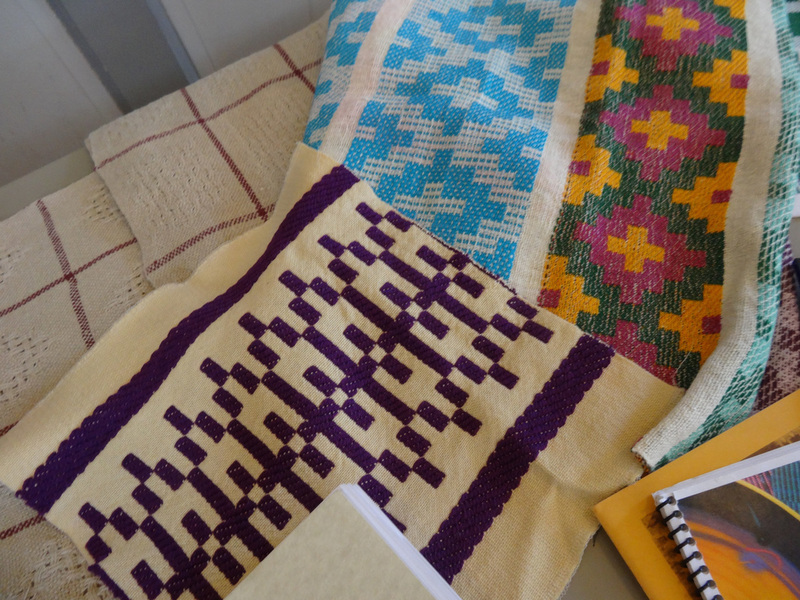 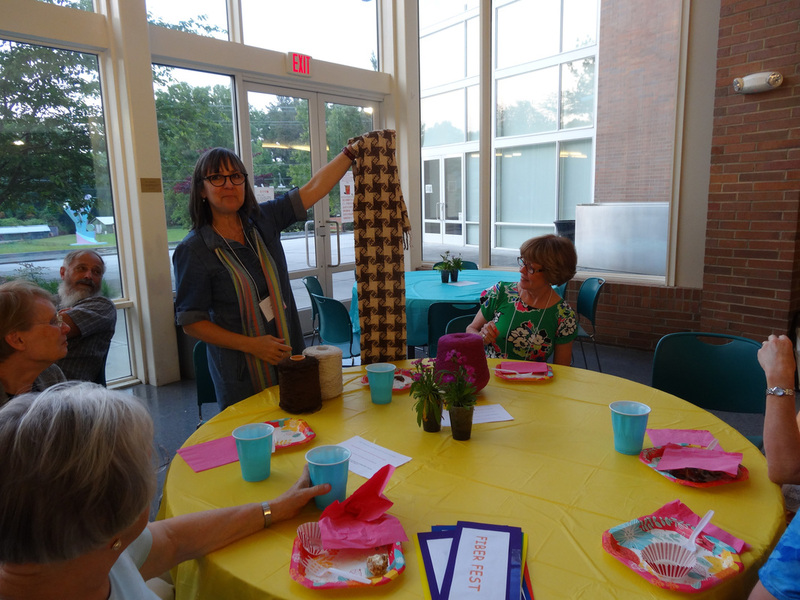 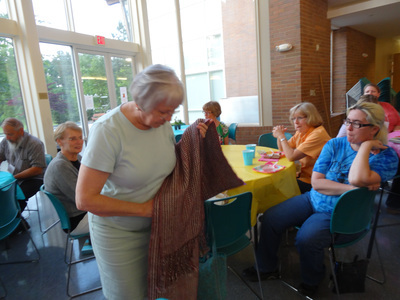 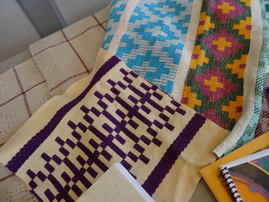 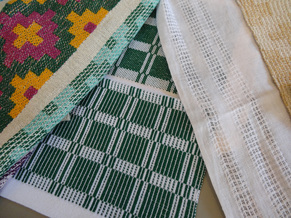 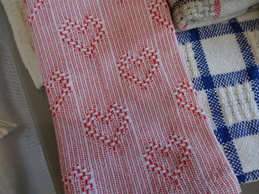 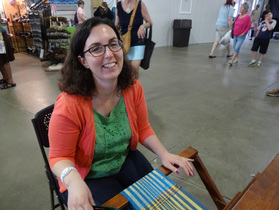 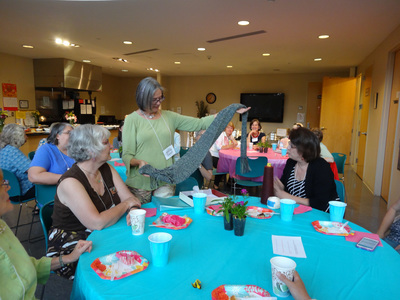 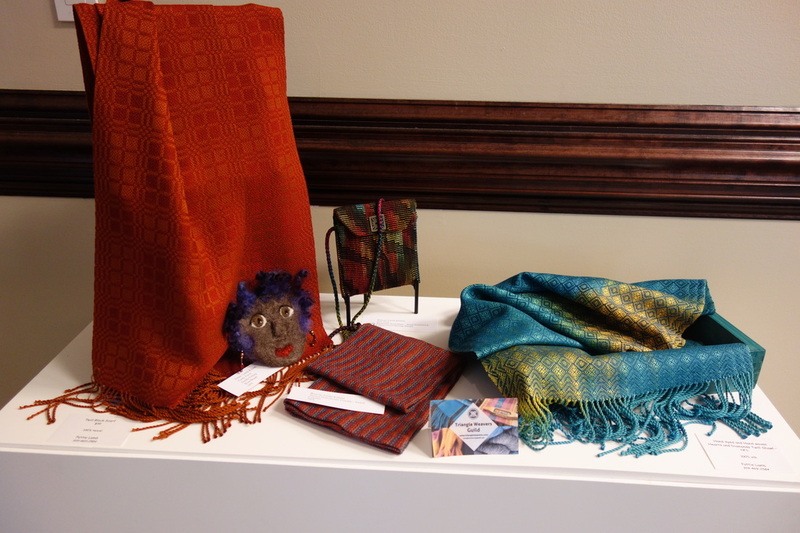 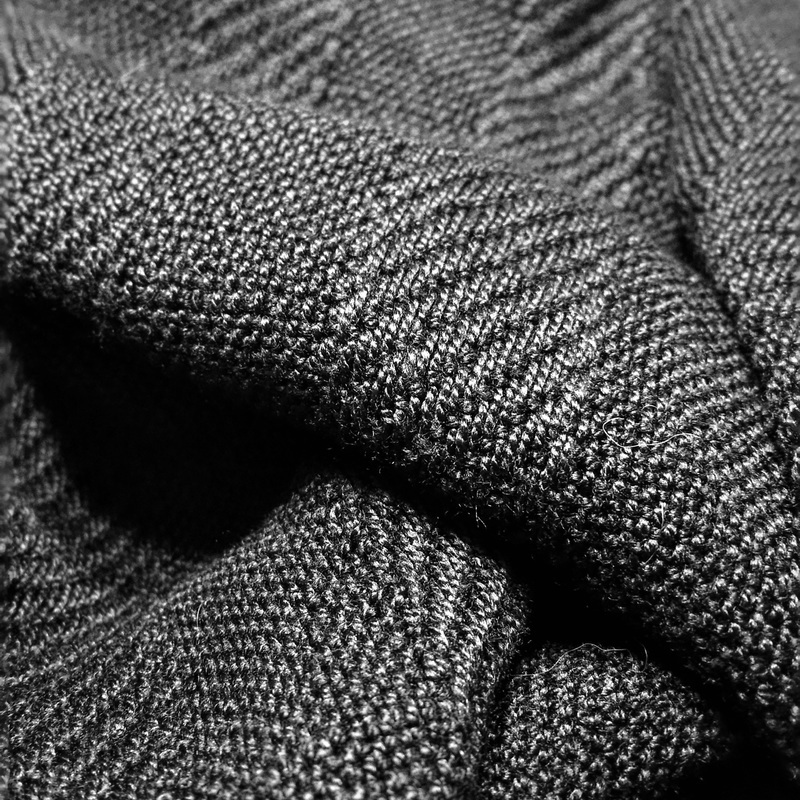 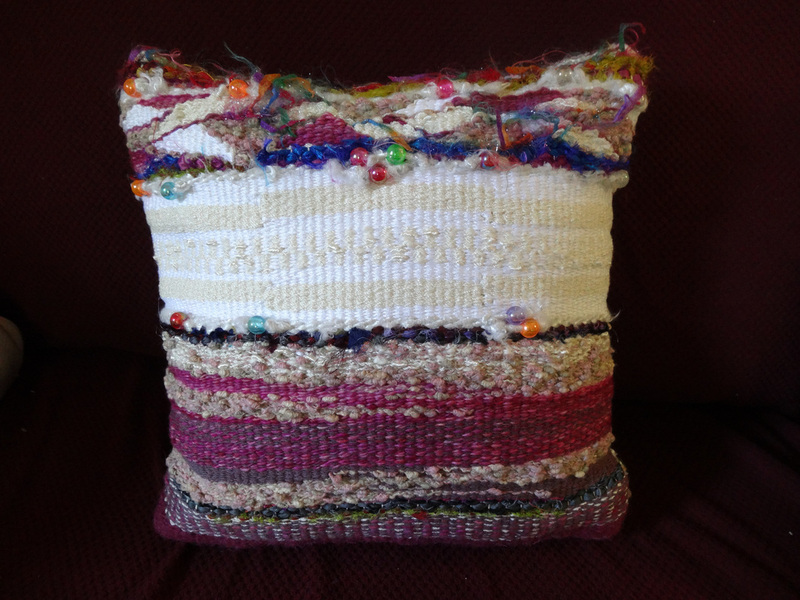 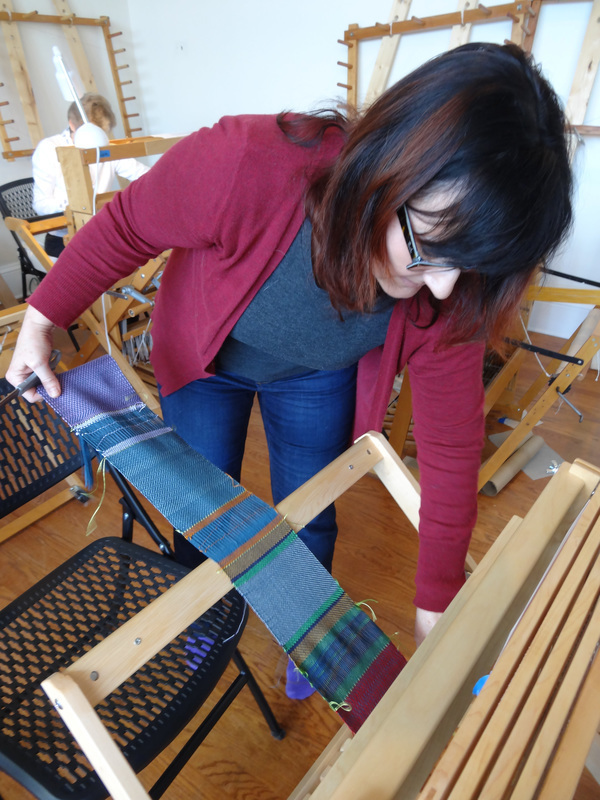 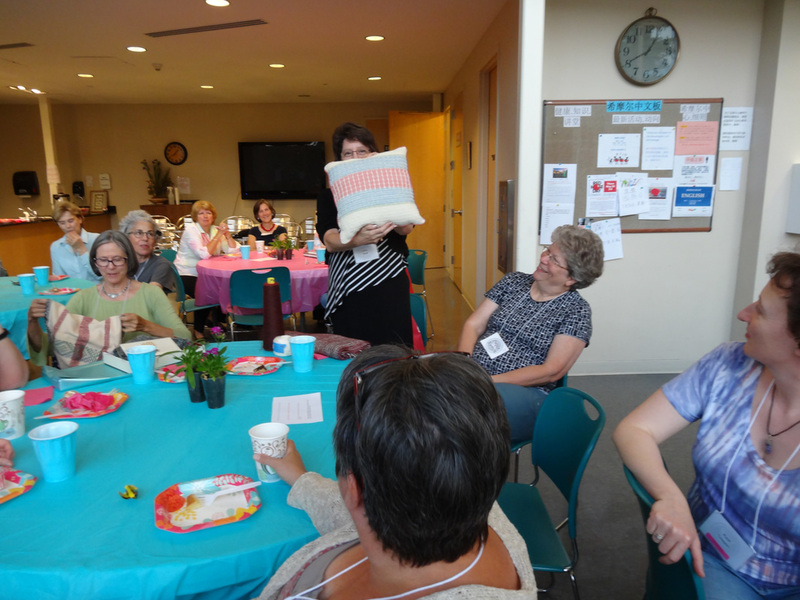 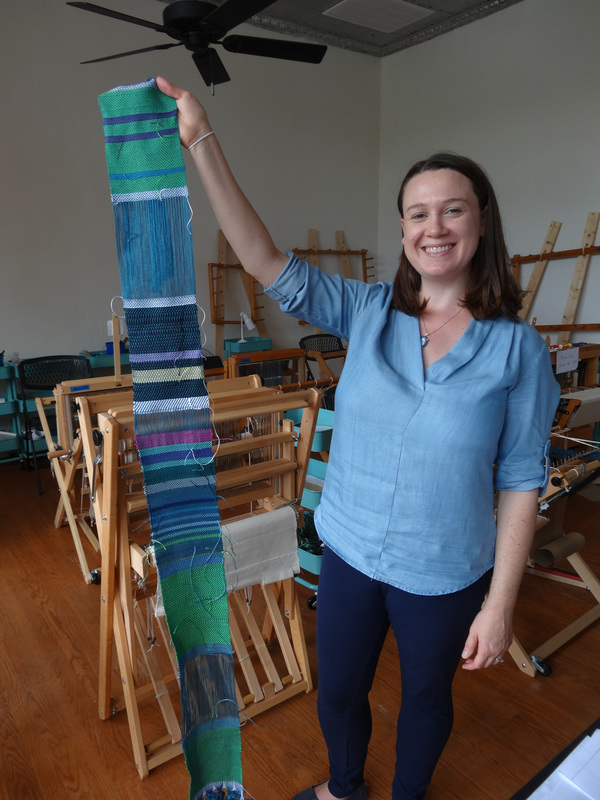 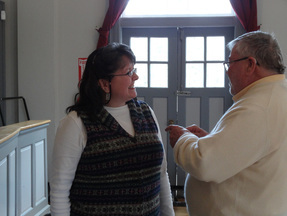 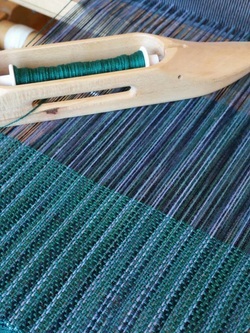 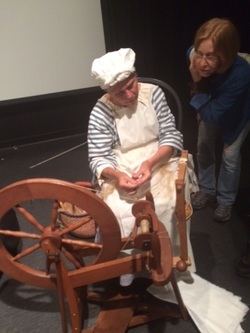 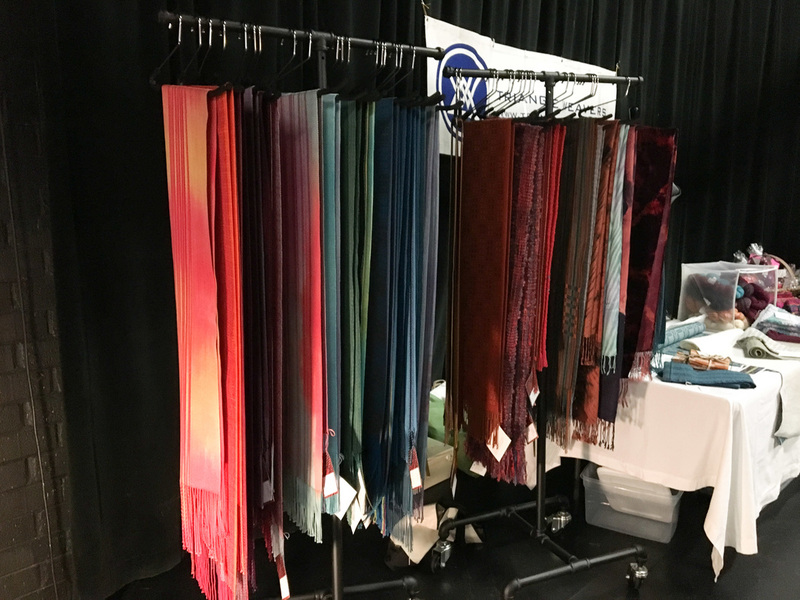 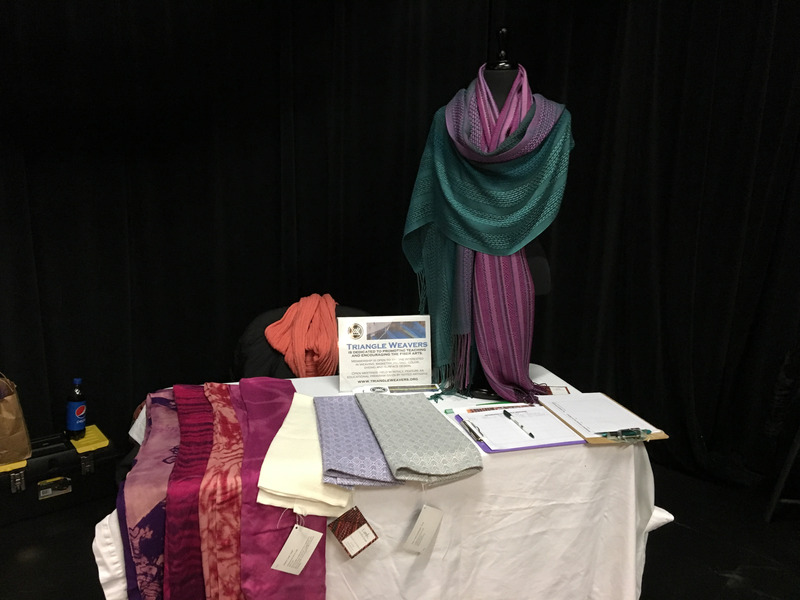 Pam Rumney presented the program "Linen is My Thing"
Amanda Feigel brought a stick woven rug. 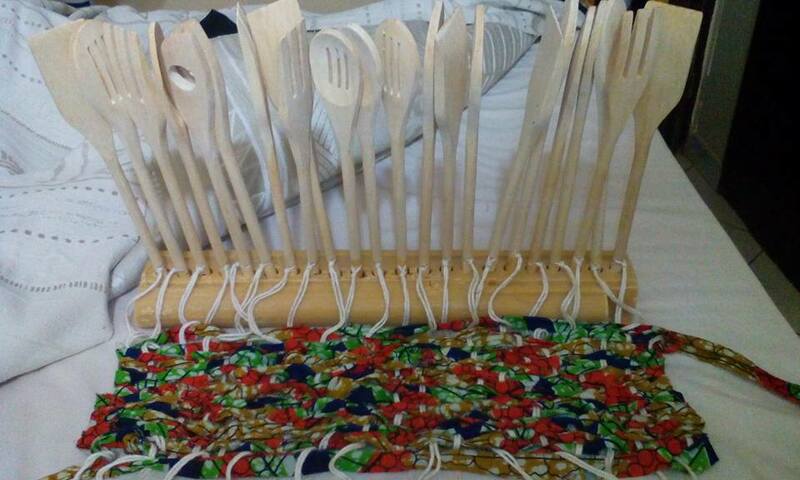 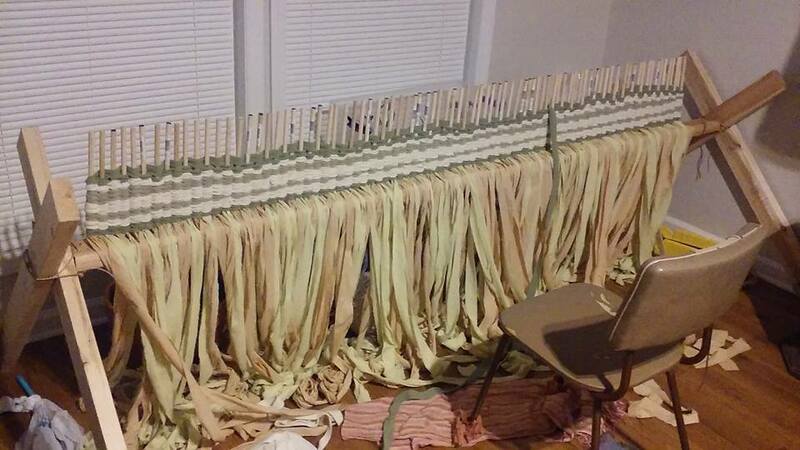 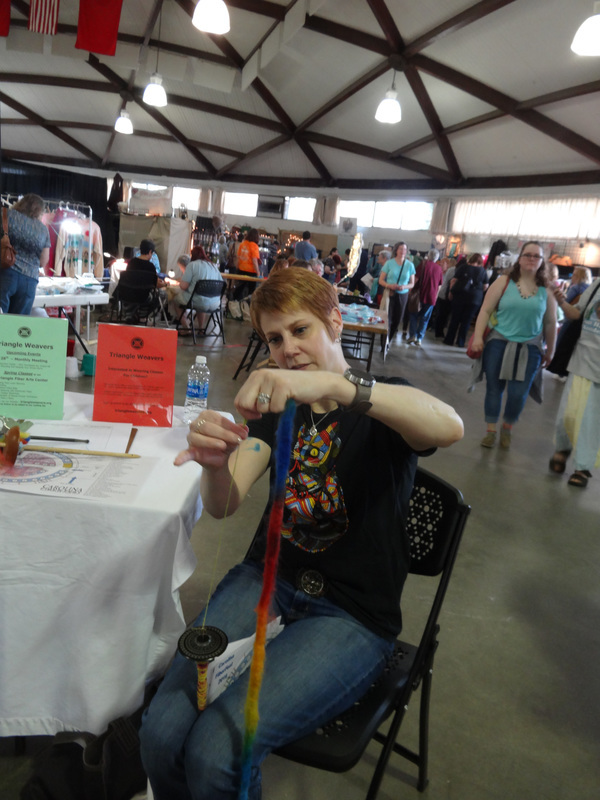 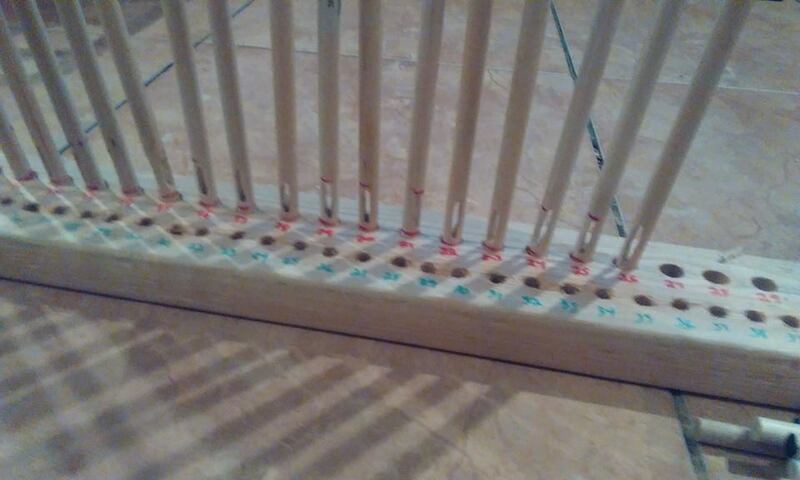 She sent pictures of examples of stick looms that she has made, one of which was made out of a long bar of soap and wooden spoons! 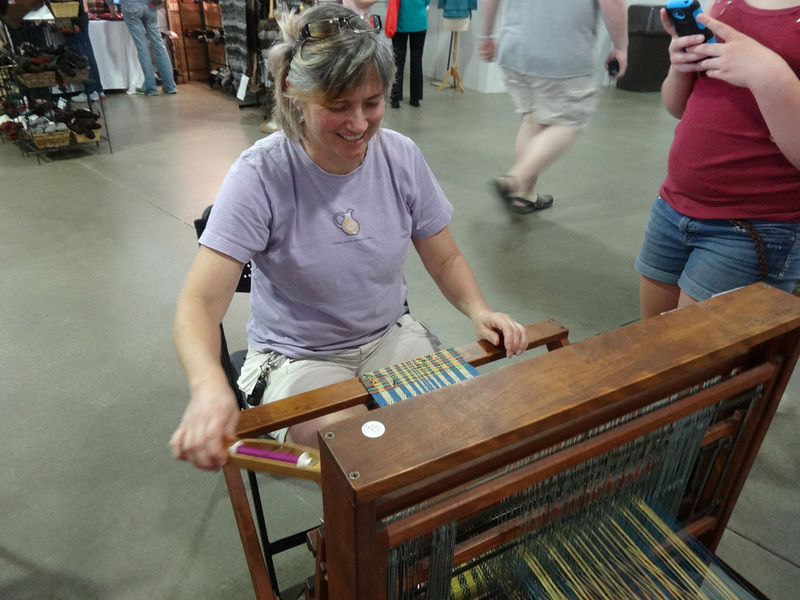 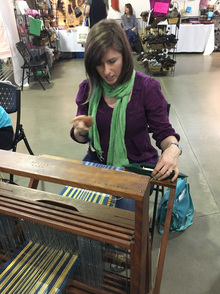 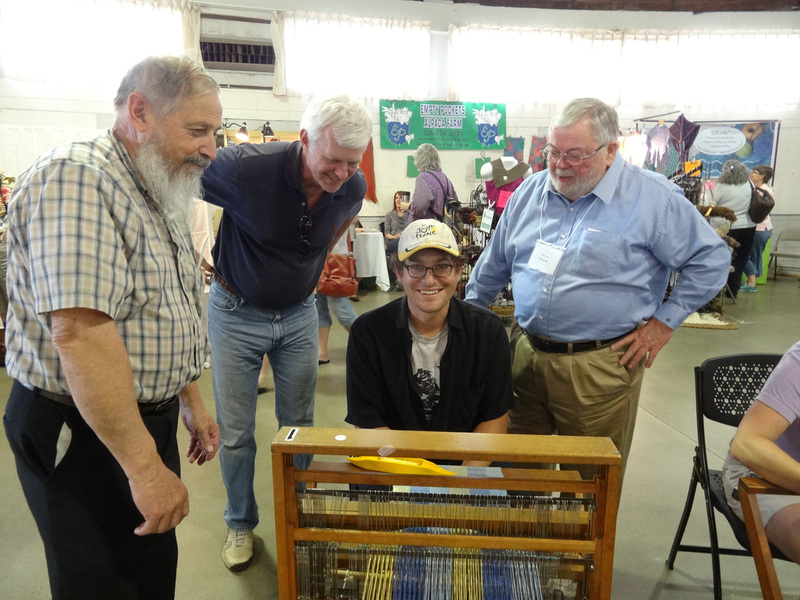 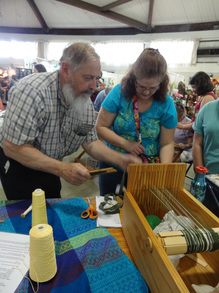 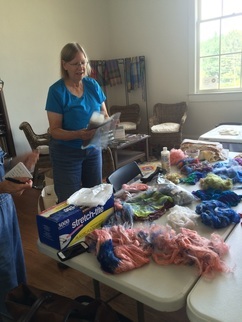 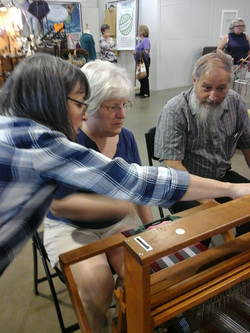 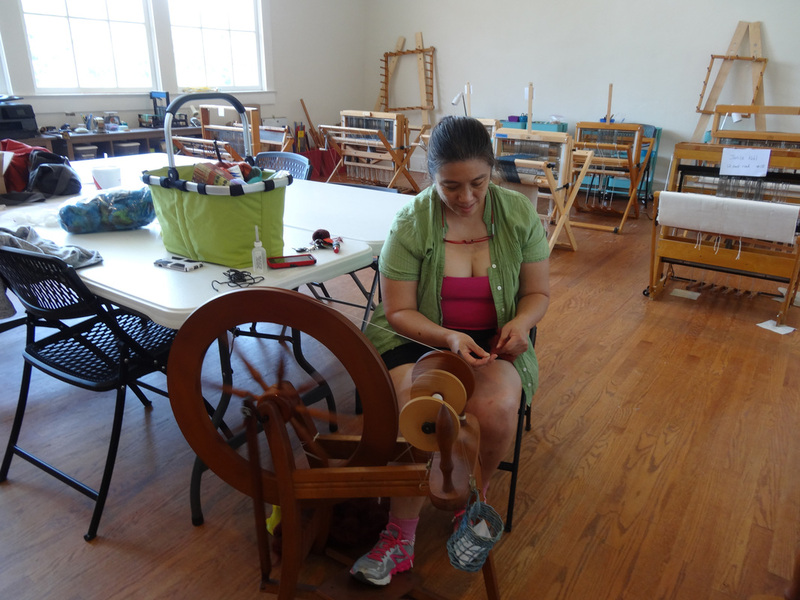 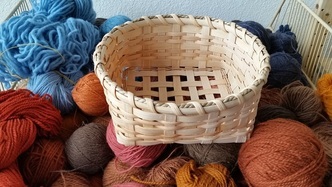 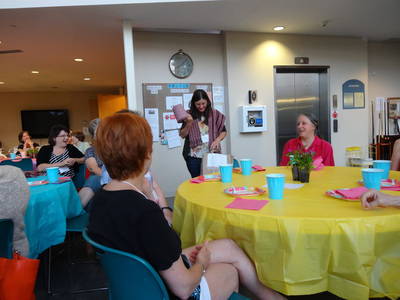 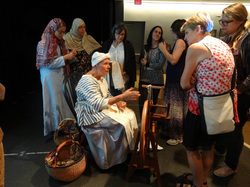 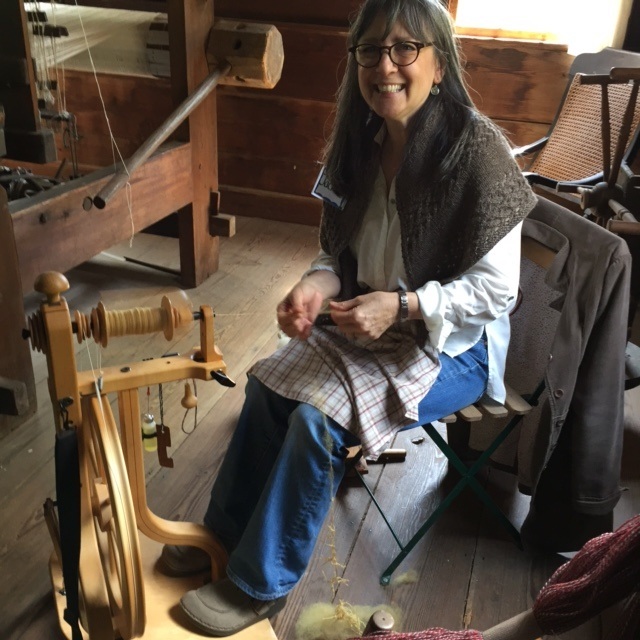 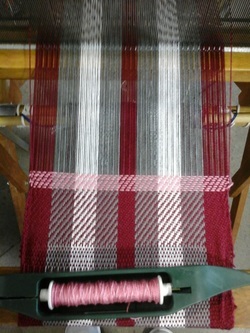 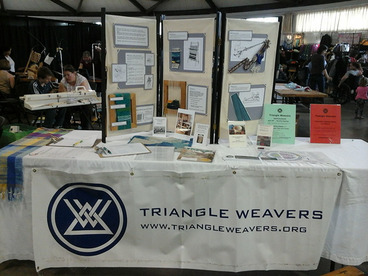 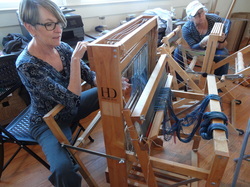 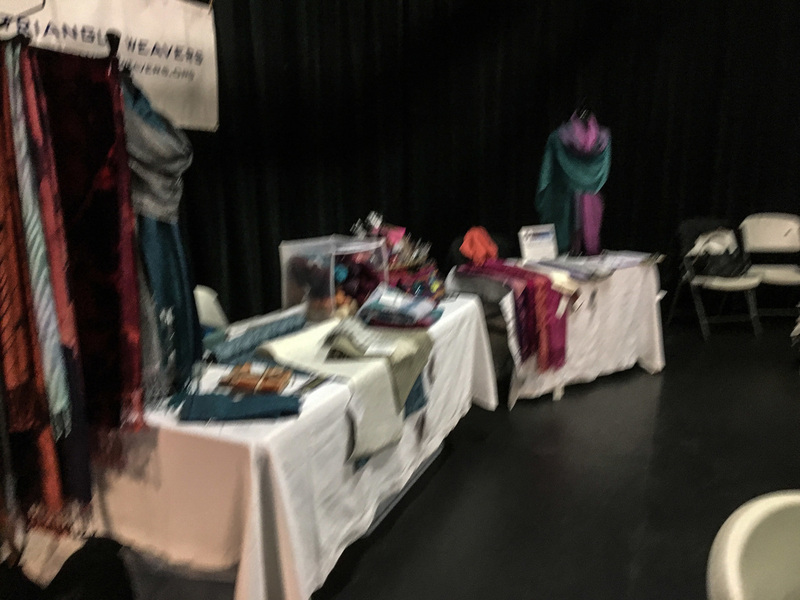 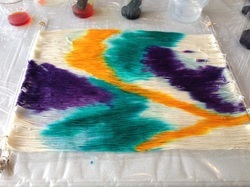 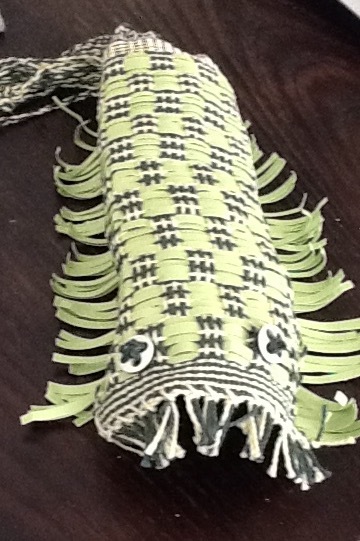 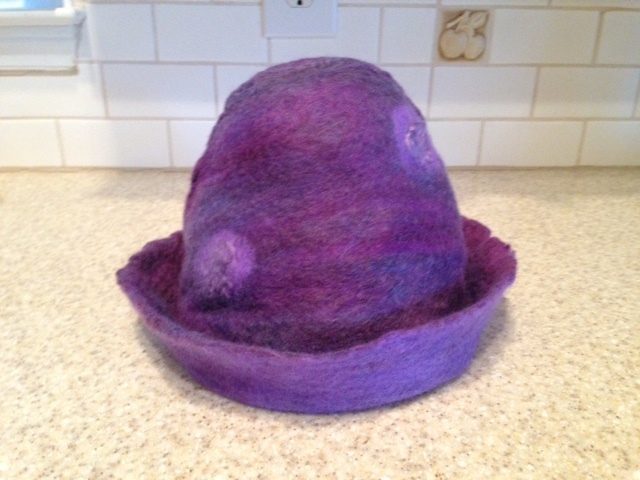 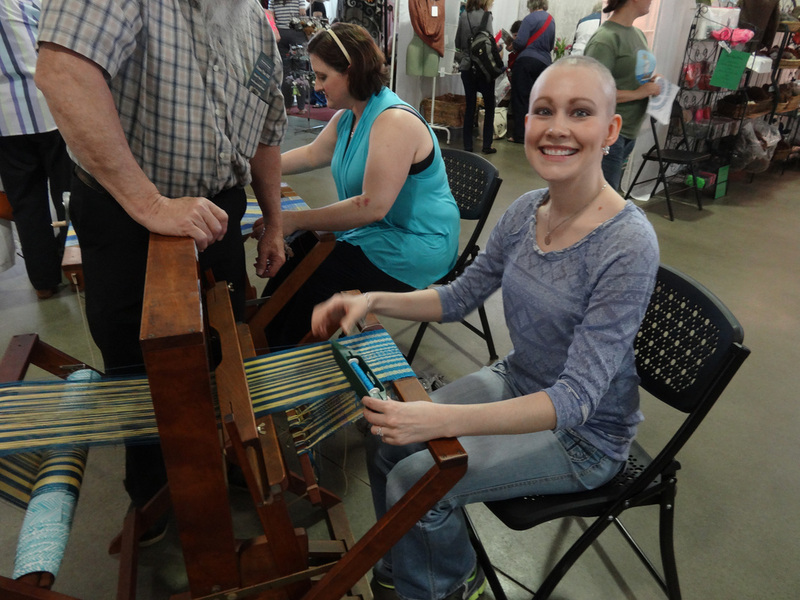 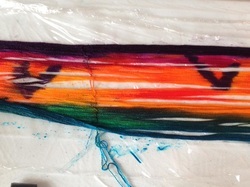 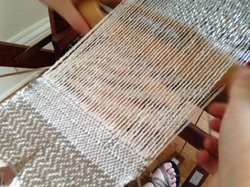 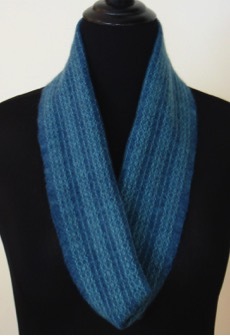 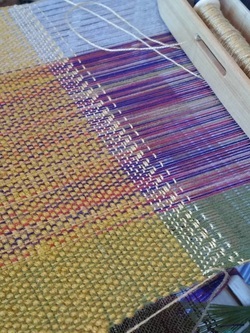 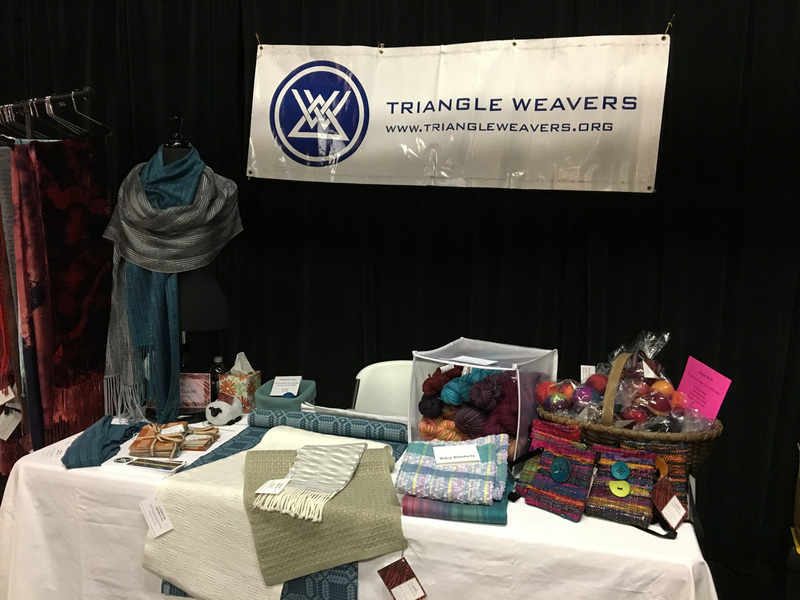 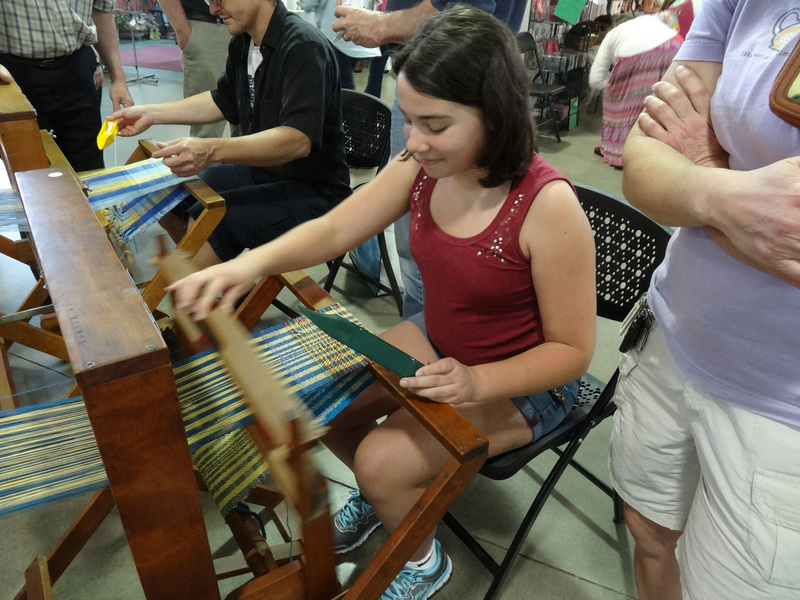 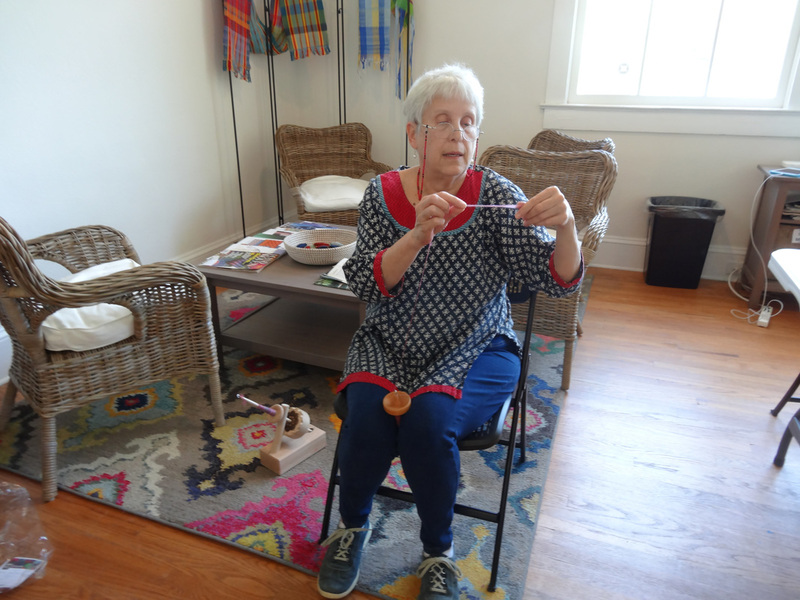 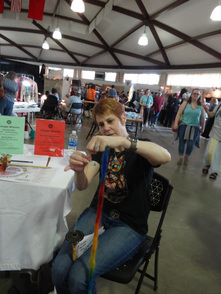 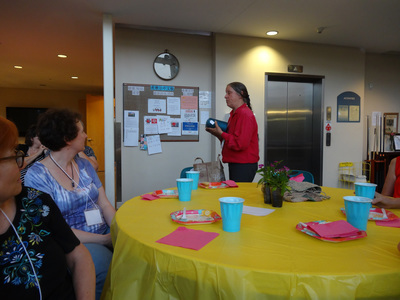 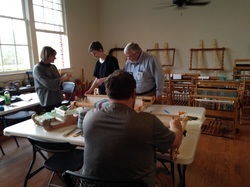 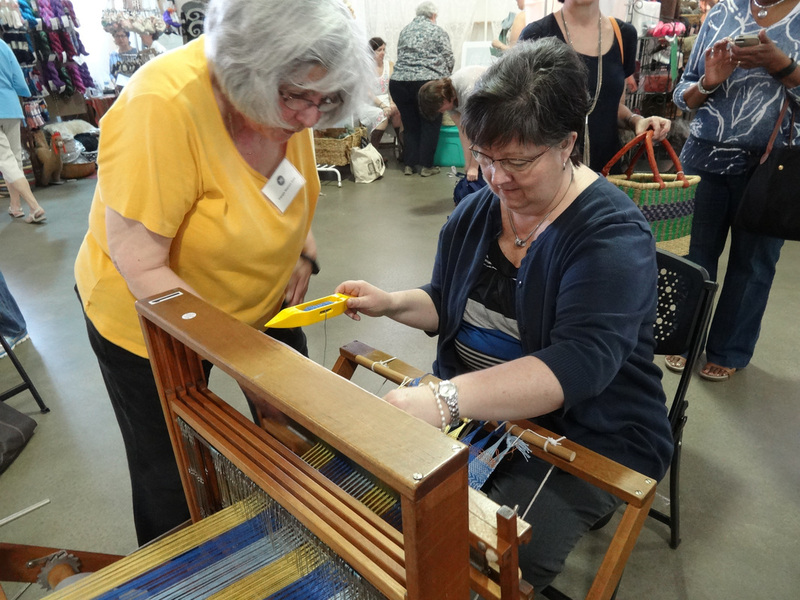 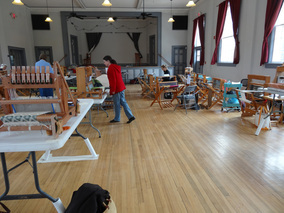 "In addition to our children's event on May 14th, Triangle Weavers has hosted two other groups of children this spring. 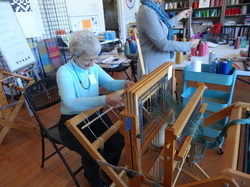 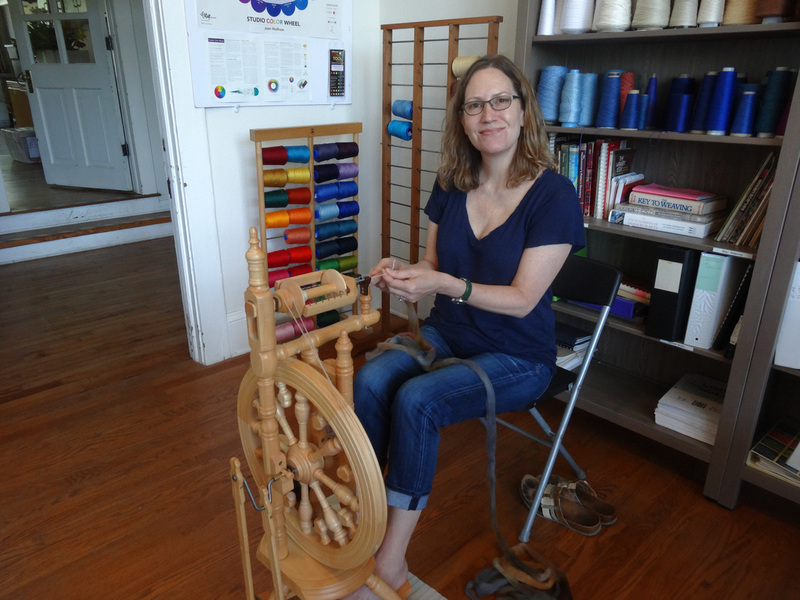 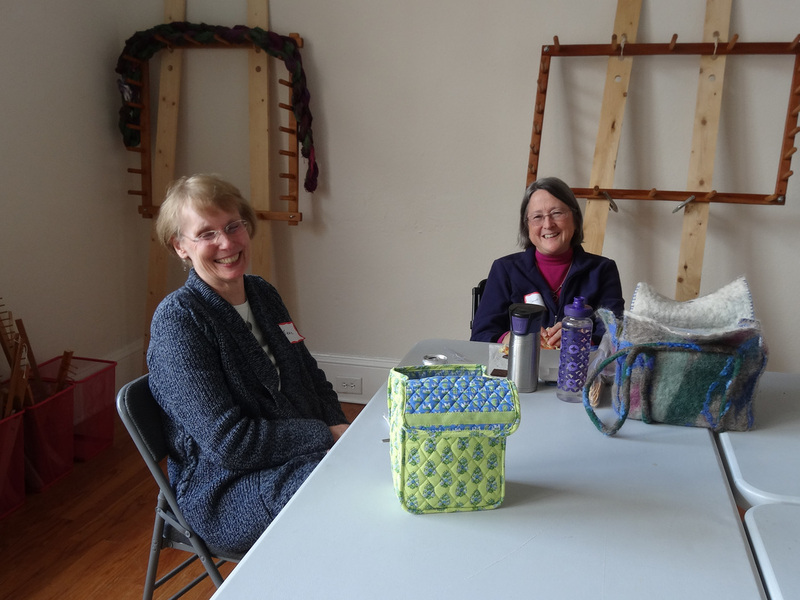 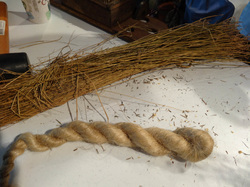 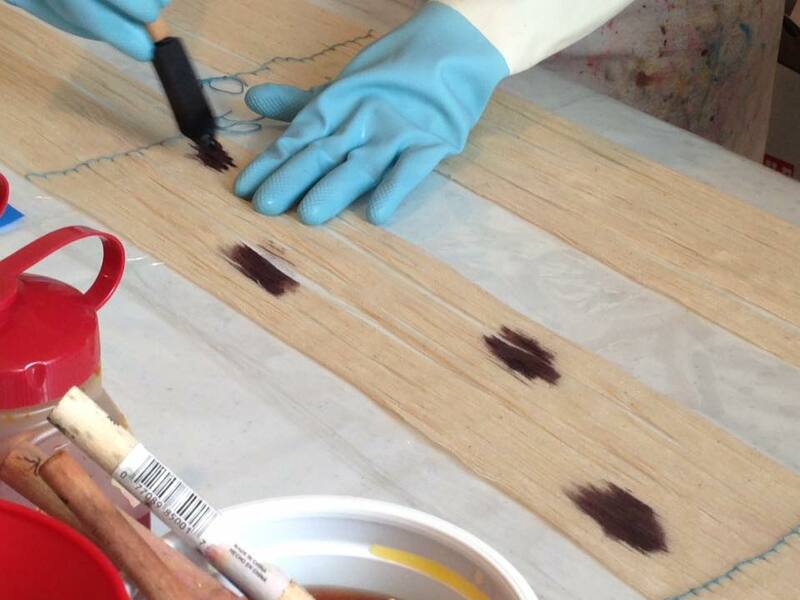 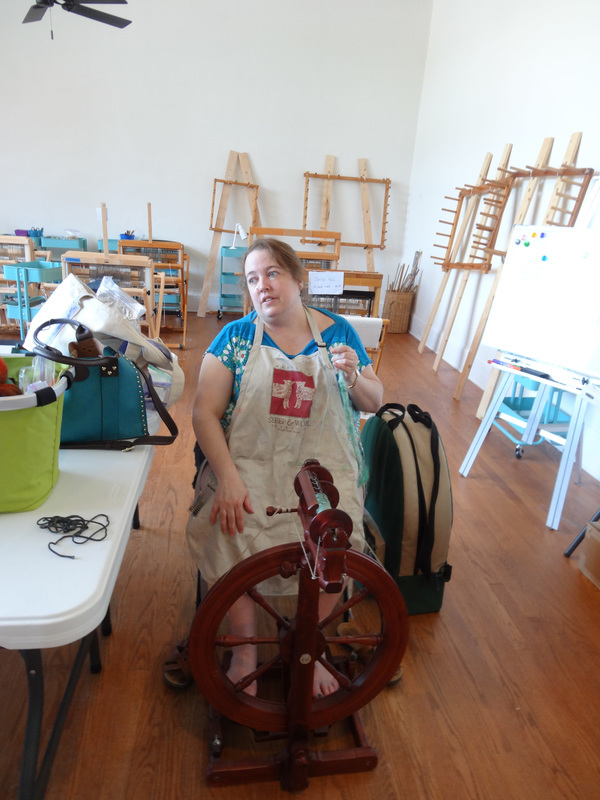 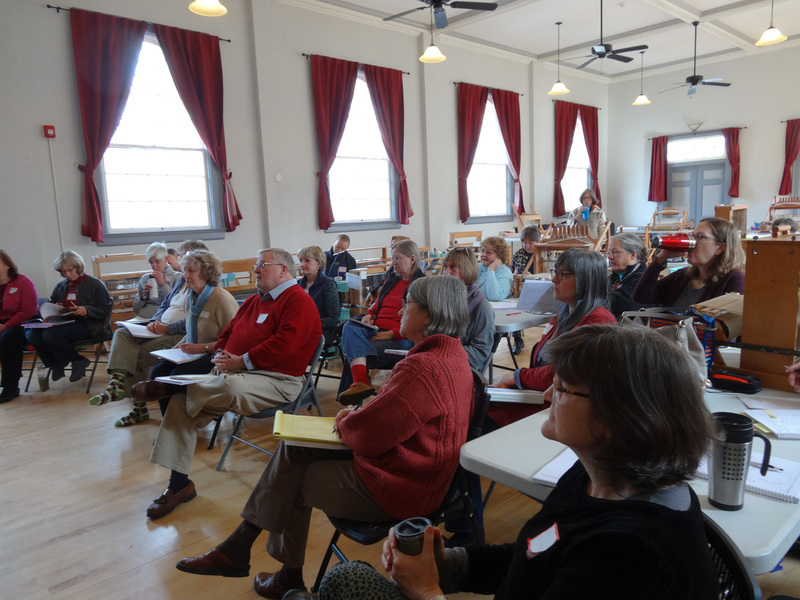 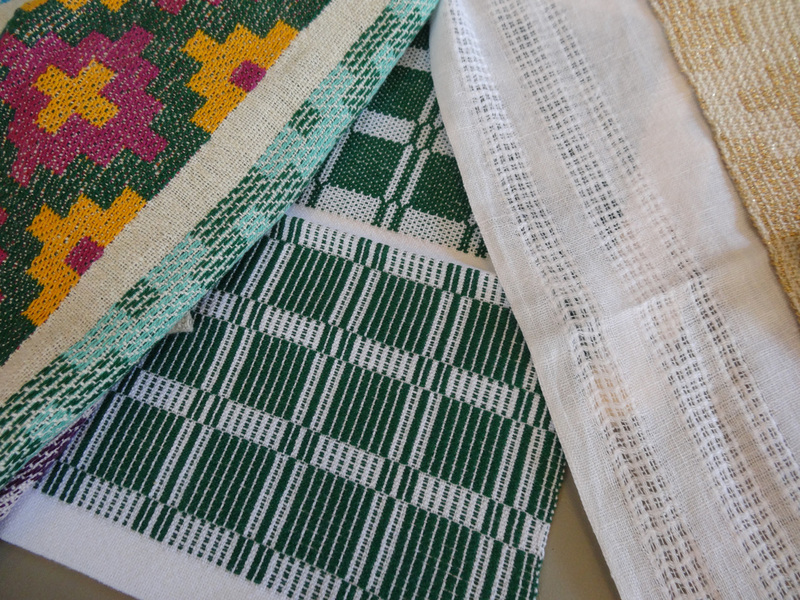 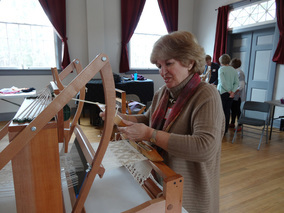 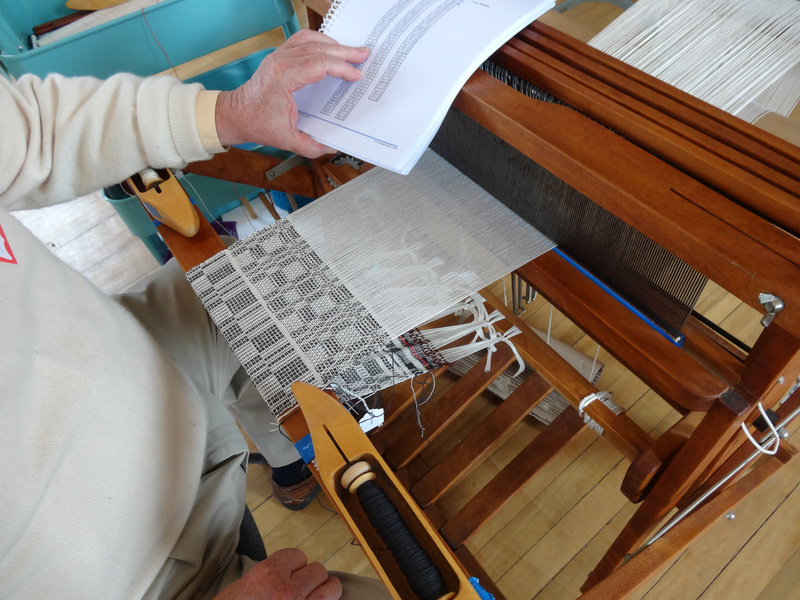 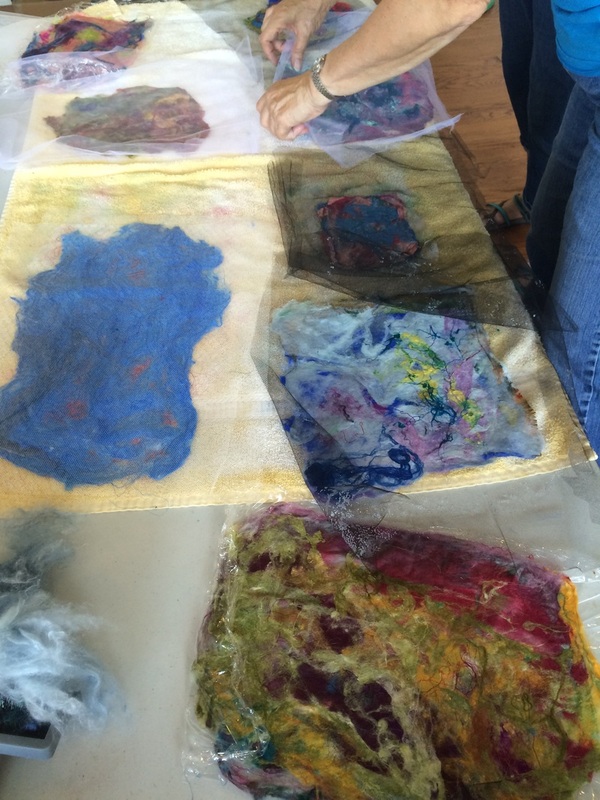 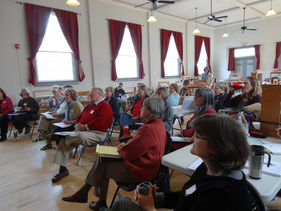 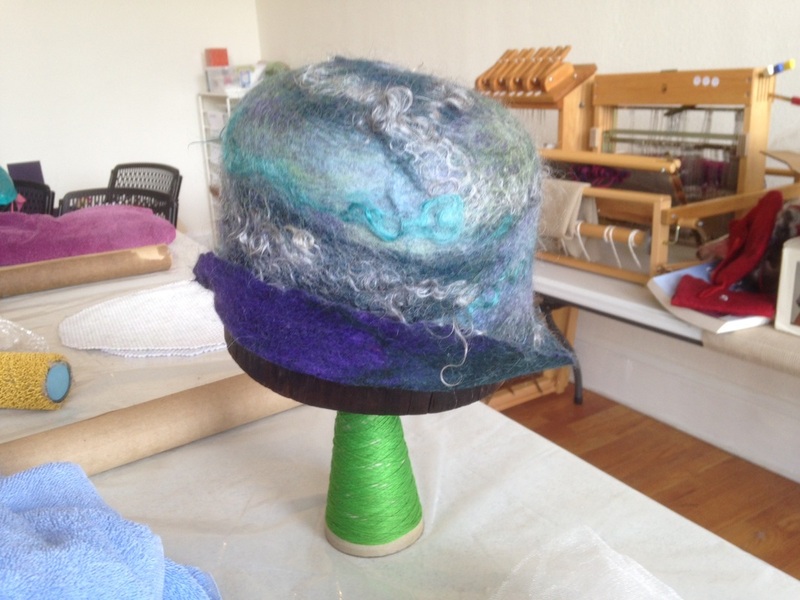 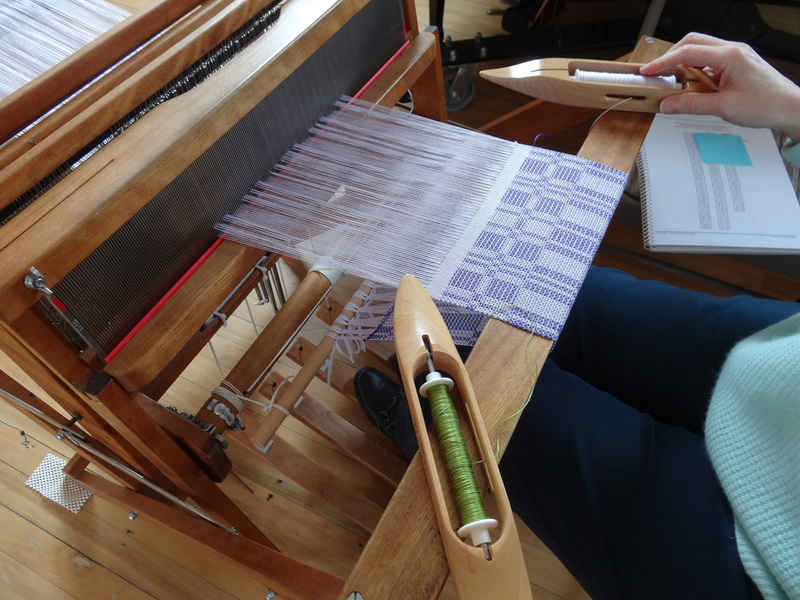 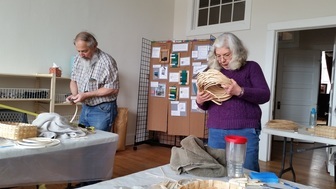 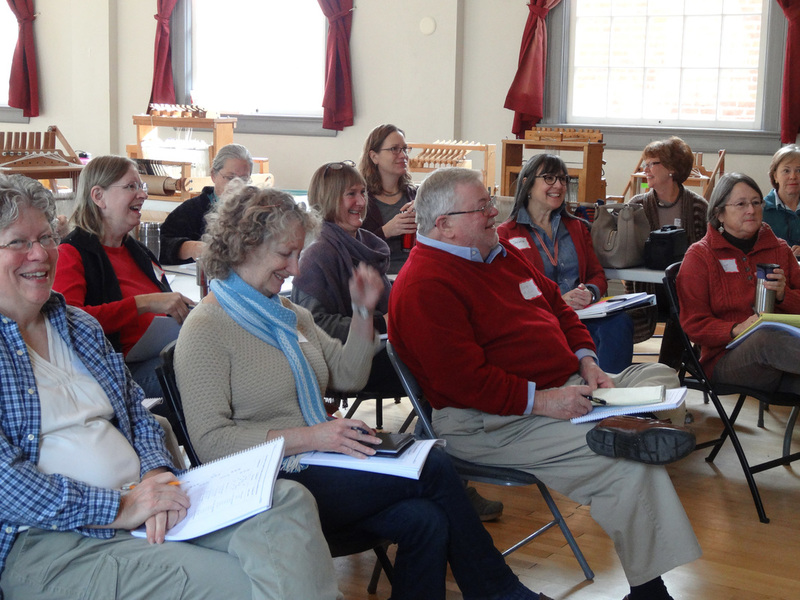 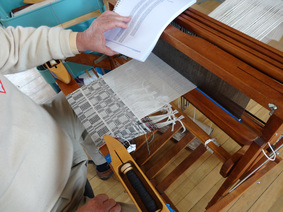 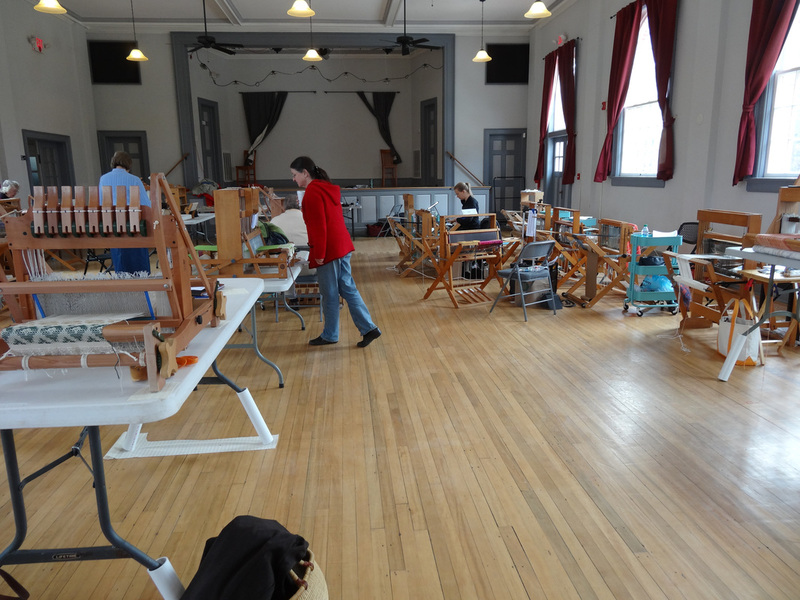 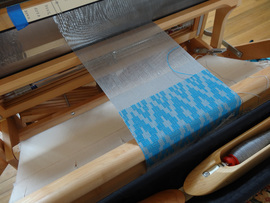 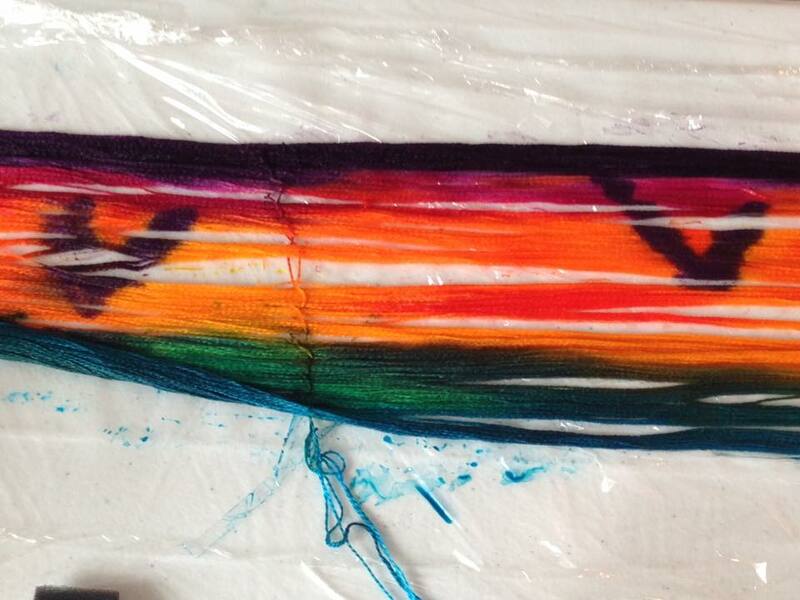 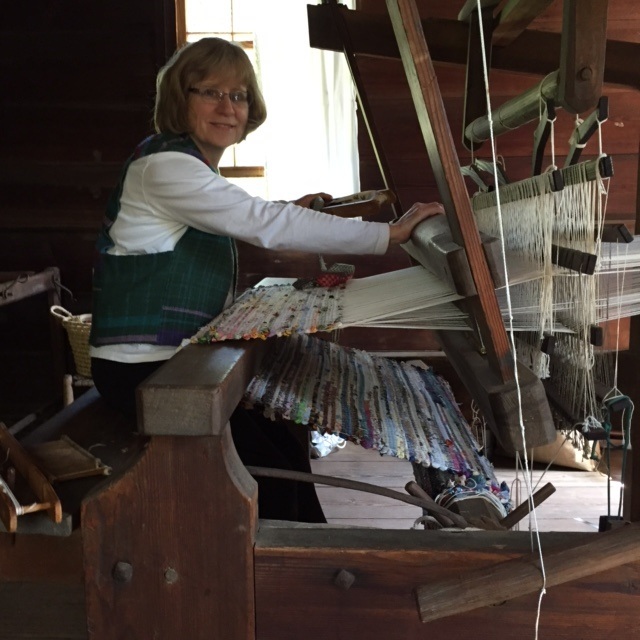 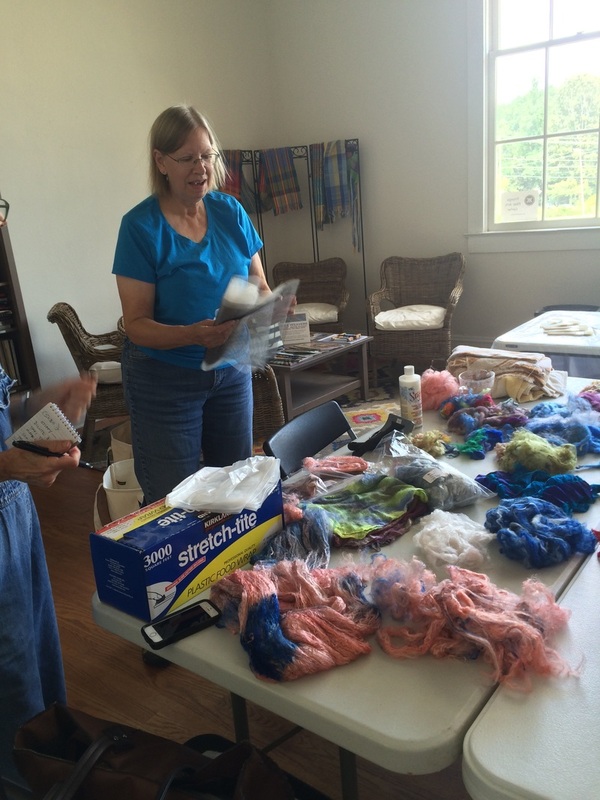 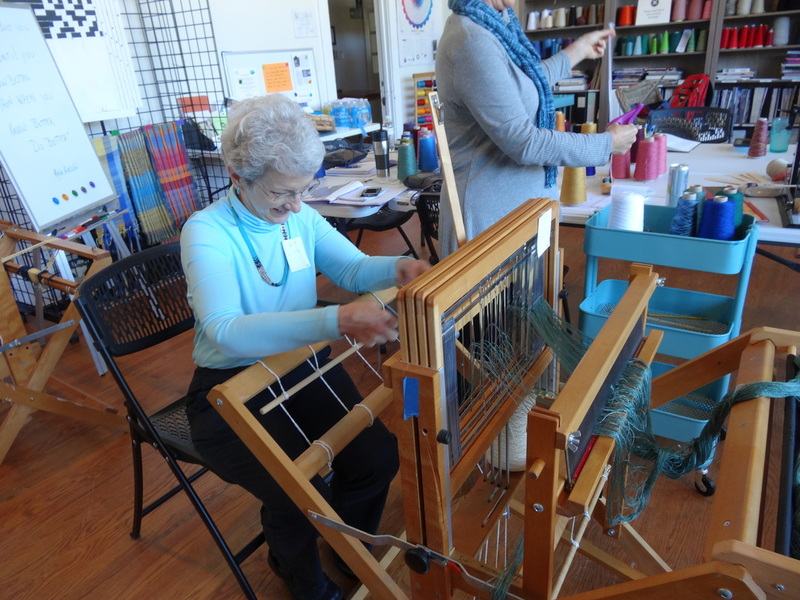 In April we had a group of six from a local Montessori school come for the morning to talk about fiber and weaving. The students had an opportunity to weave on floor looms and to use a frame loom and T-shirts to make a map for their classroom. 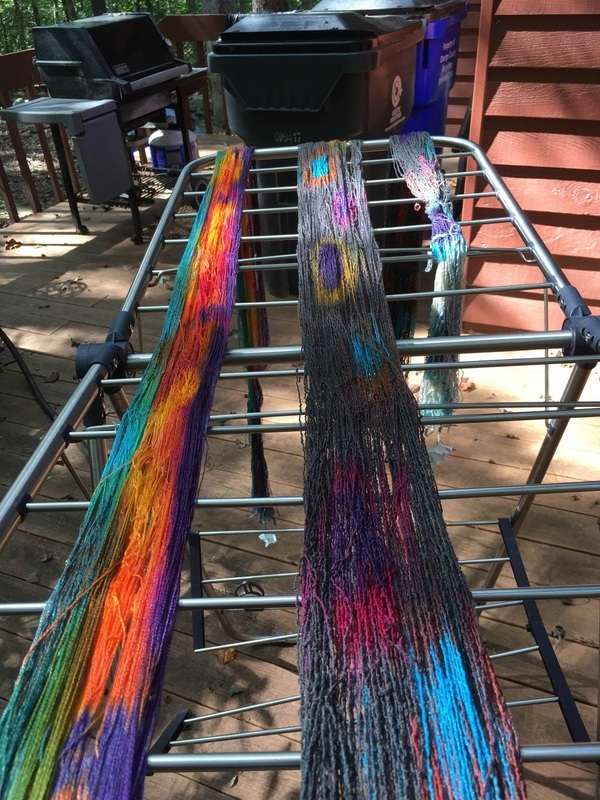 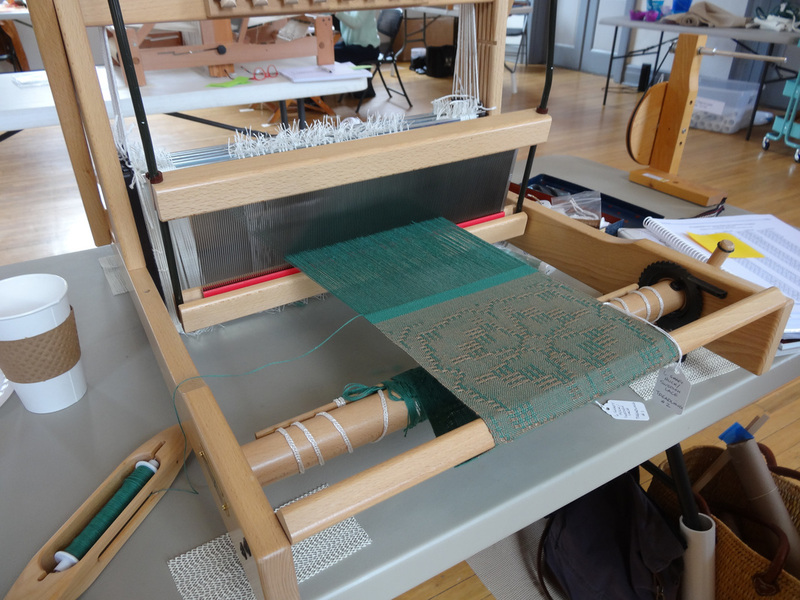 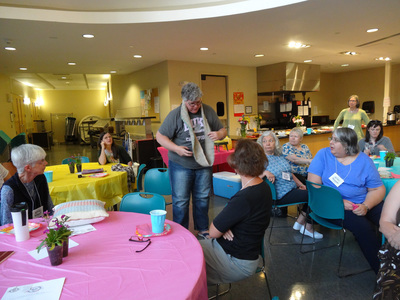 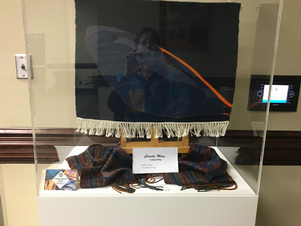 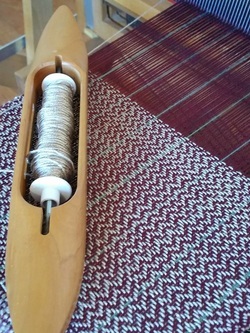 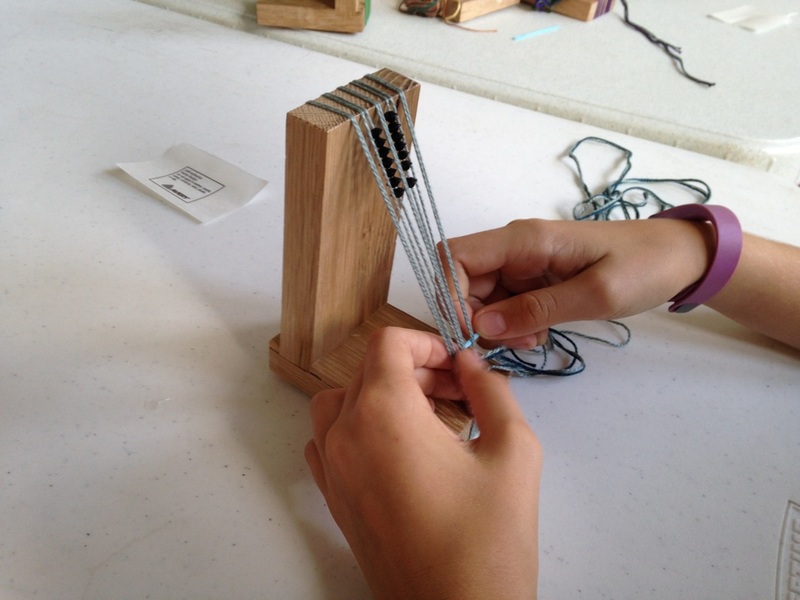 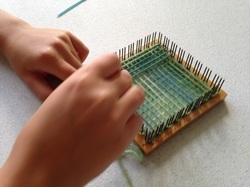 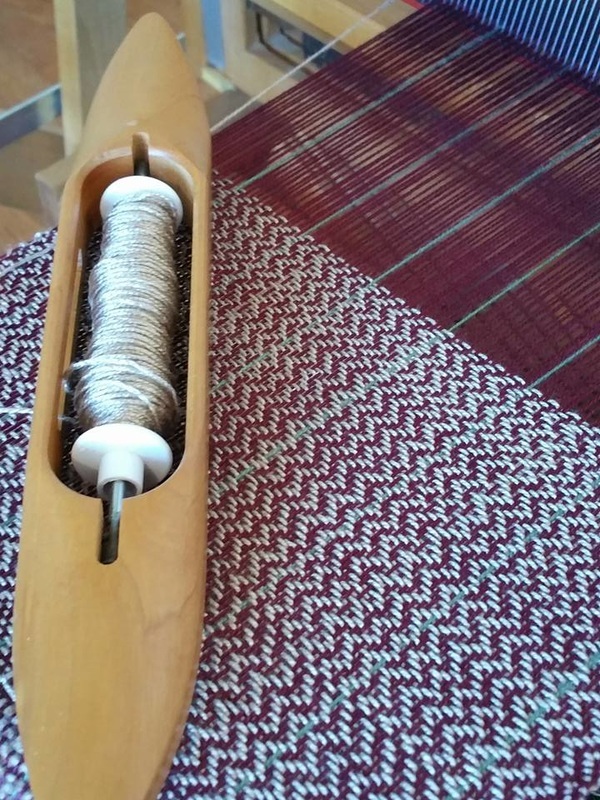 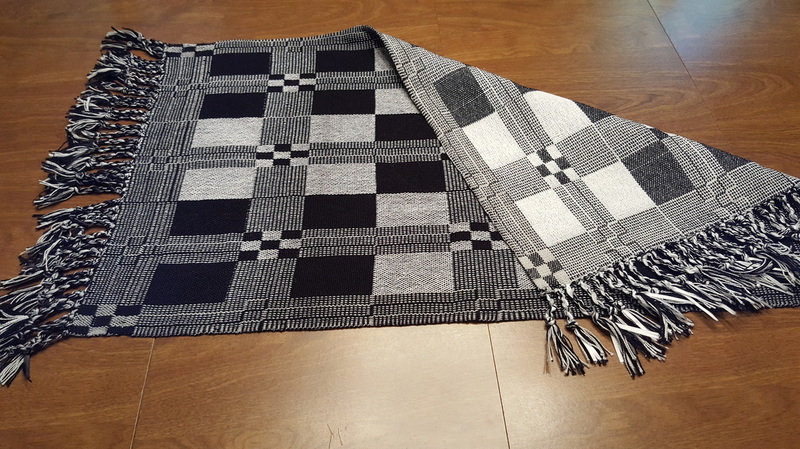 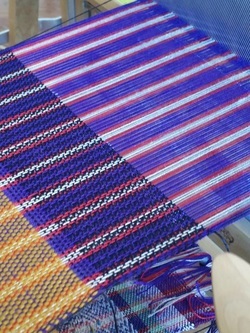 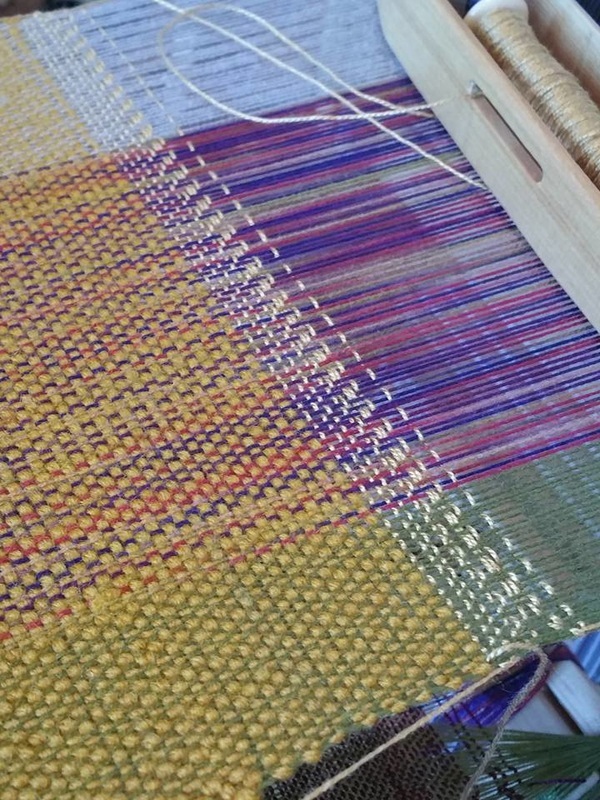 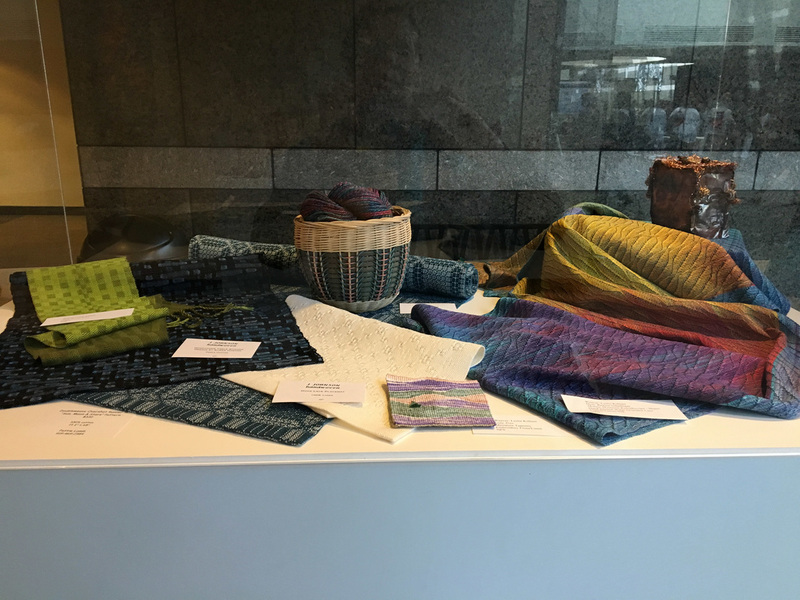 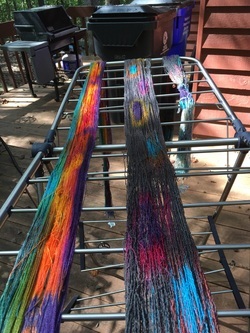 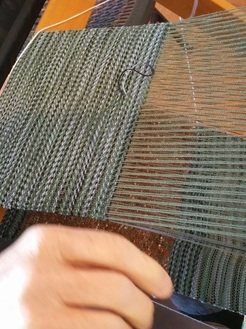 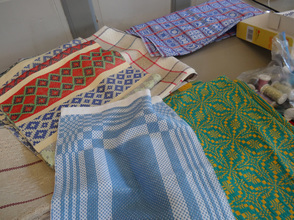 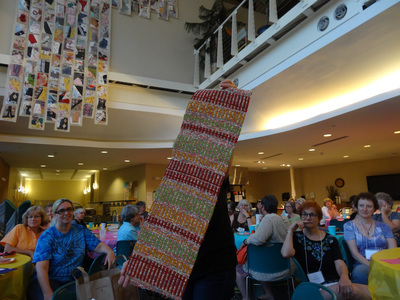 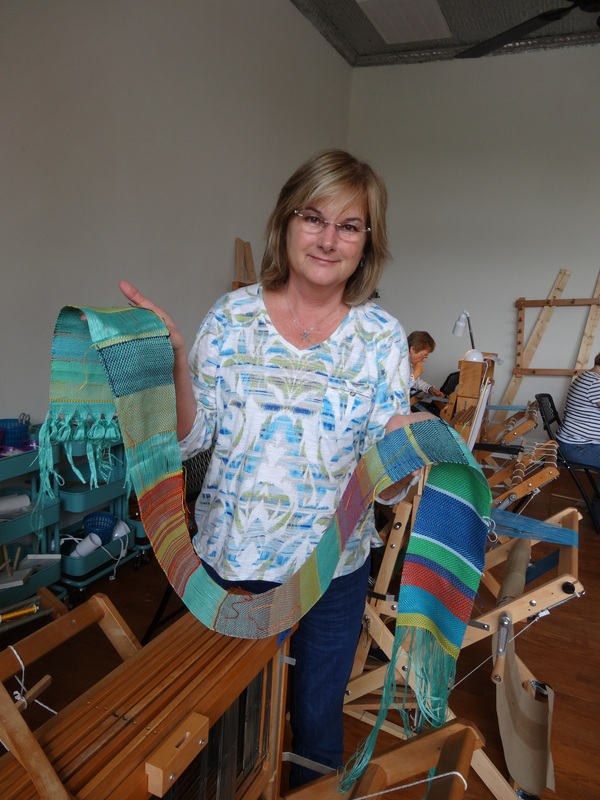 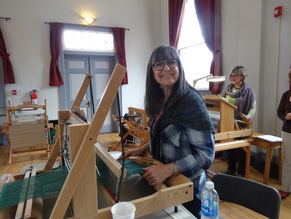 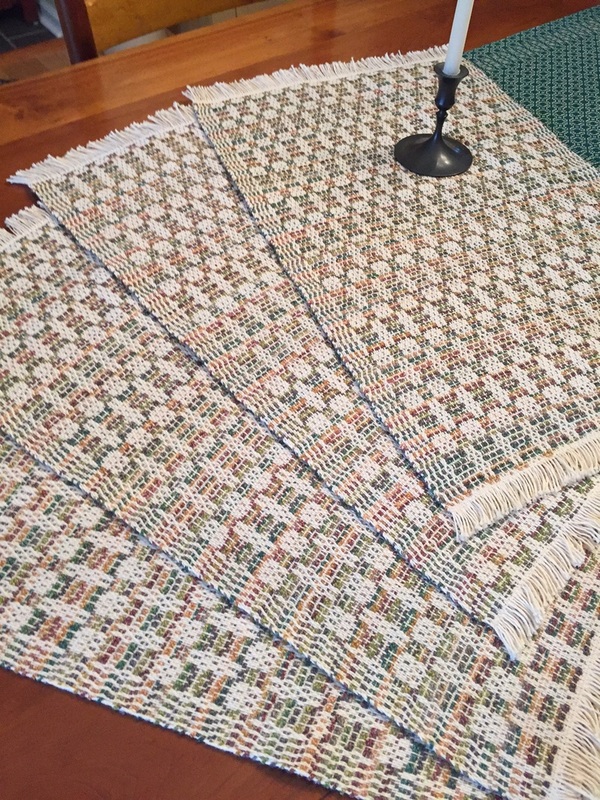 In July, as part of their quilting, sewing and beading camp experience, a group of ten children came and wove on floor looms, weave-it looms and bracelet looms. 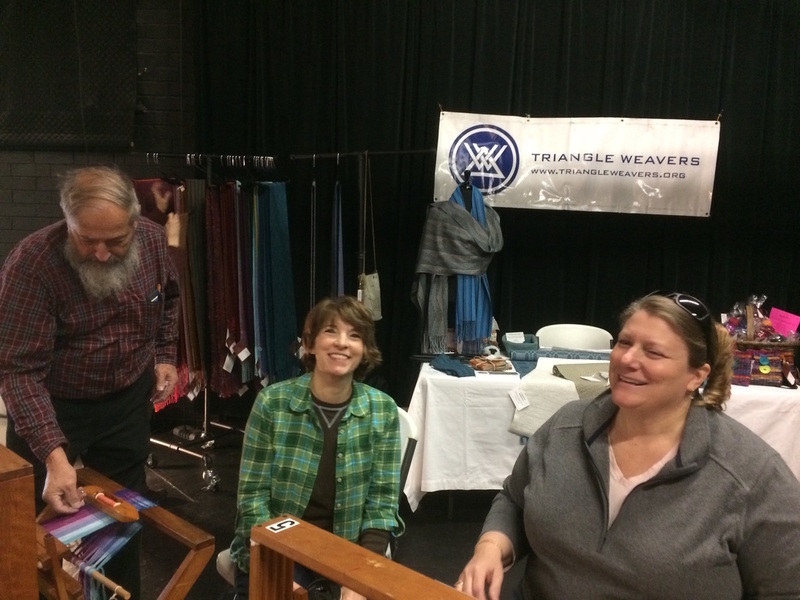 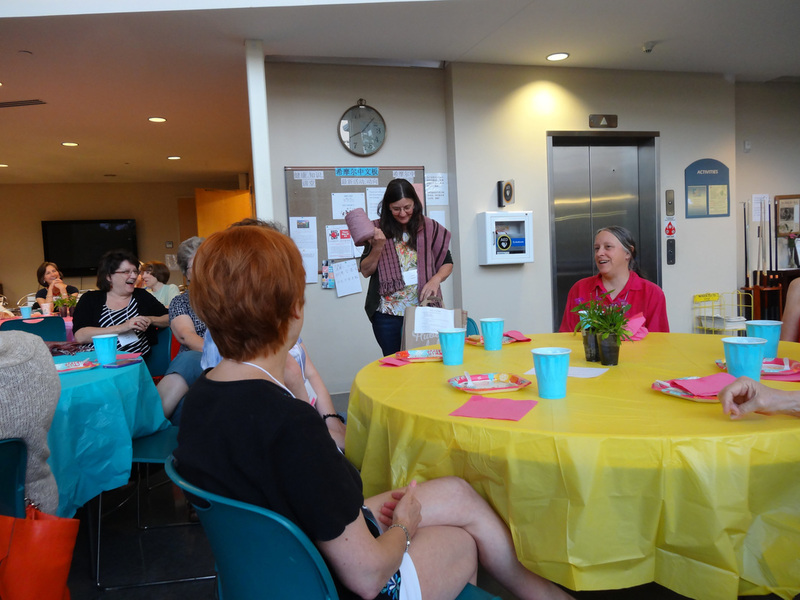 Many thanks to the TW volunteers who made these events possible!" 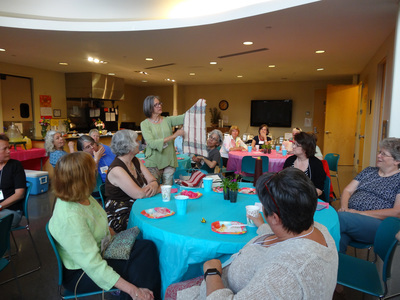 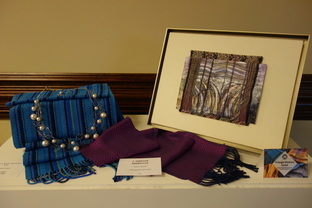 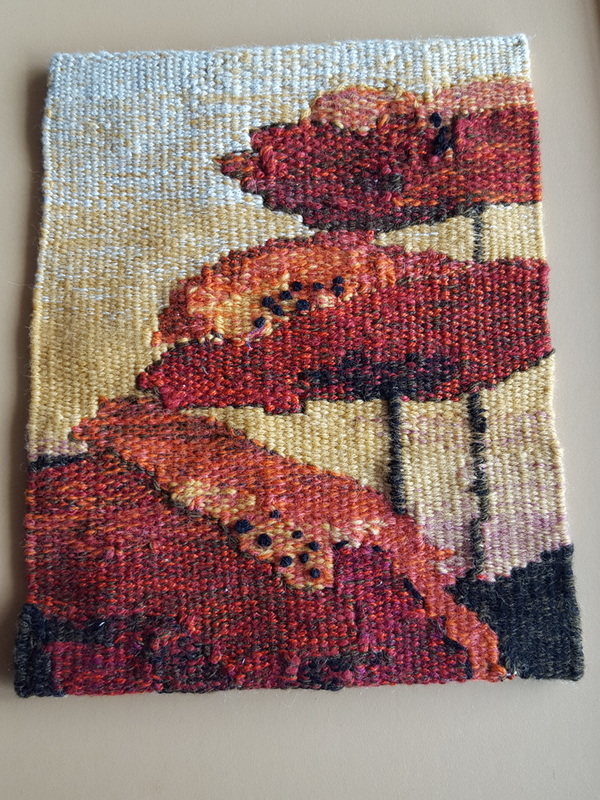 Stacy Miller's beauties (a tapestry hanging and pillow) were presented later. 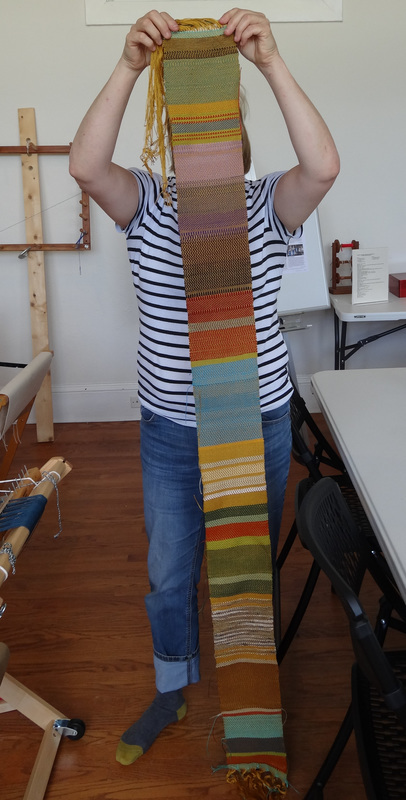 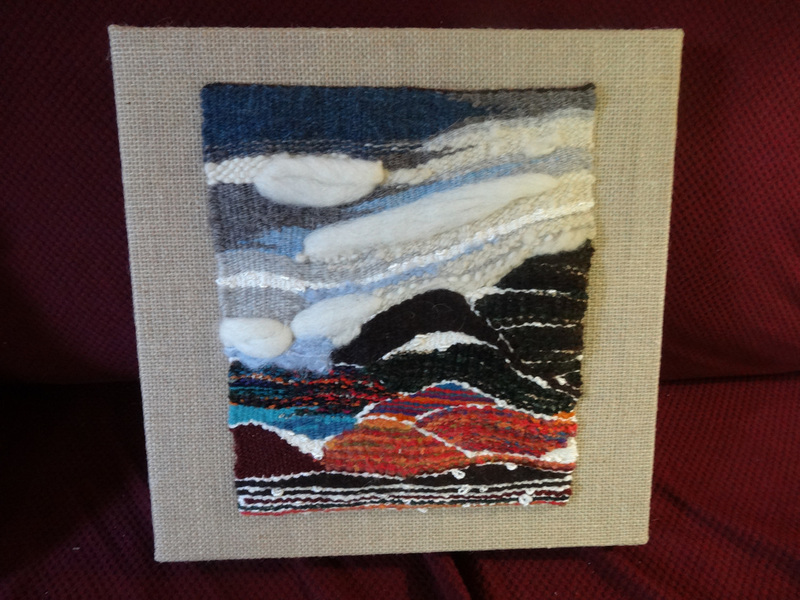 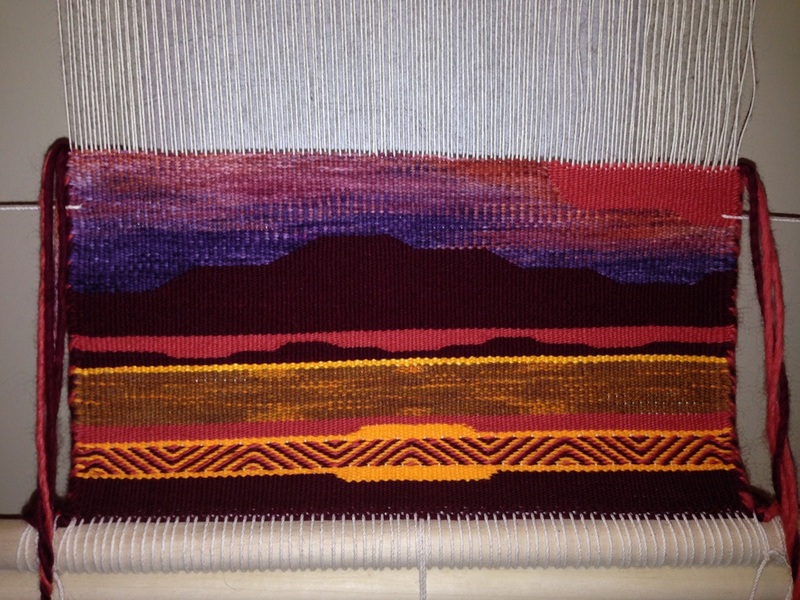 Cerah wove a wall hanging with a whole lot of shuttles (at the same time)! 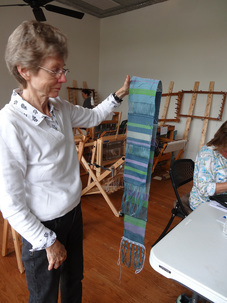 Karen wove a wall hanging an does not like having her picture taken. 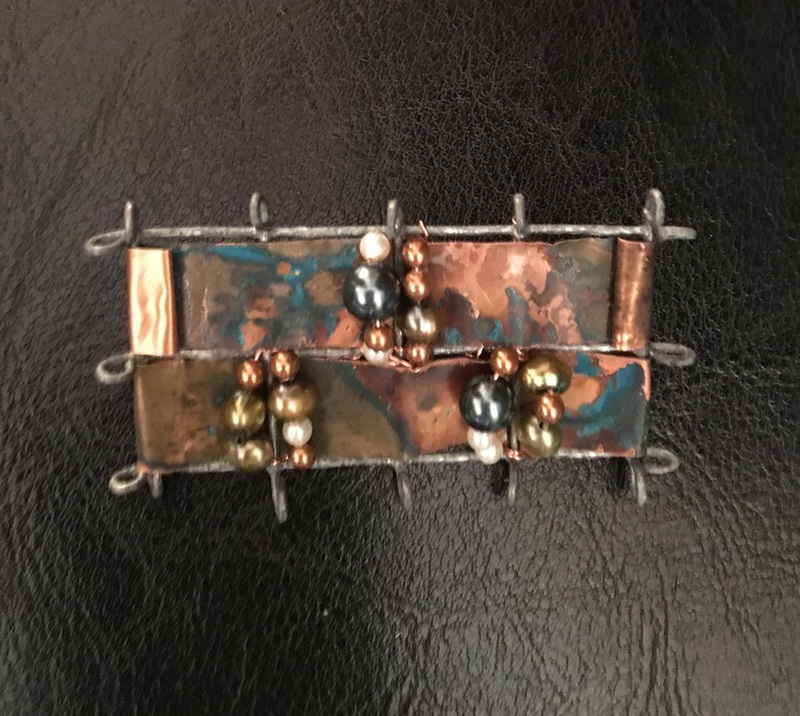 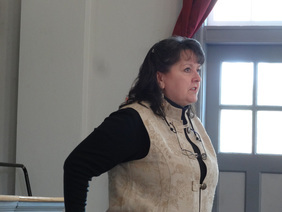 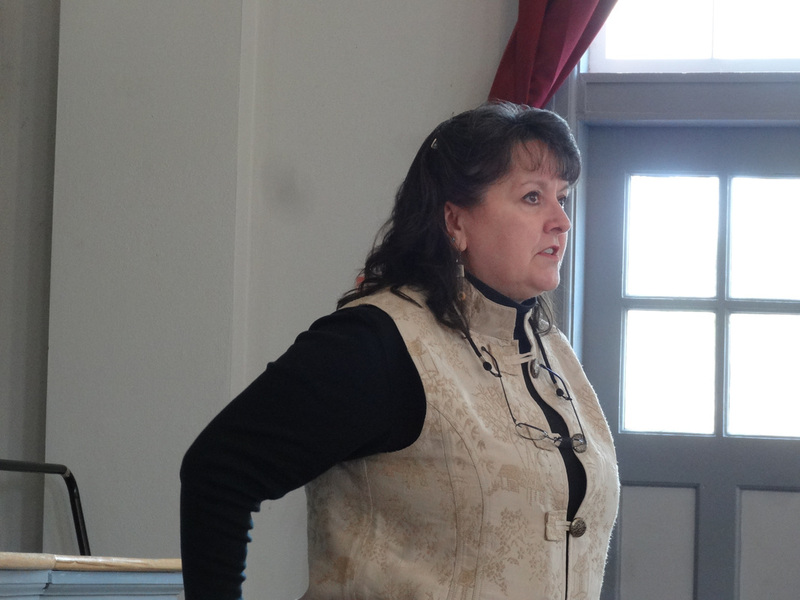 March 2016, Robyn Spady Workshop: "Block Party"